This fourth Musica-class cruiseship, Msc Magnifica, is known to be one of the most beautiful ships of Msc Cruises. 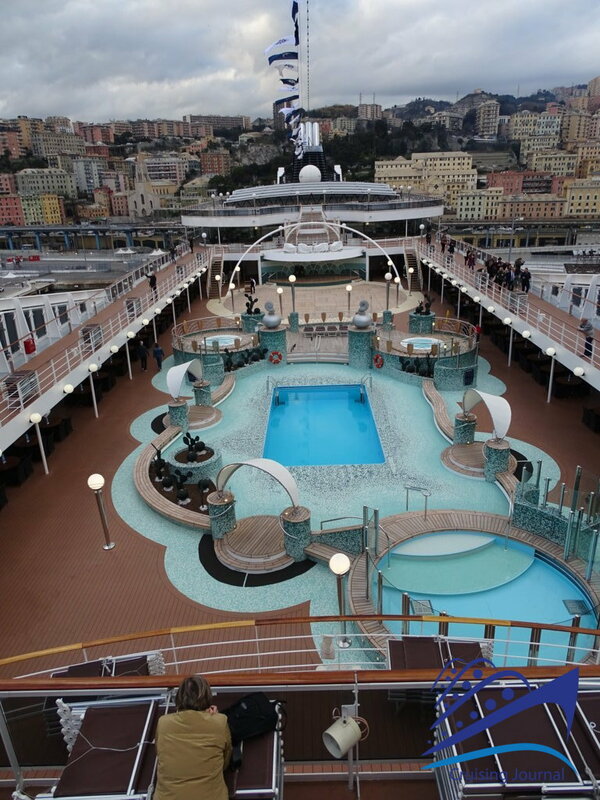 Just under 100,000 tons, it was built in 2010 in the French shipyard STX in Saint Nazaire. 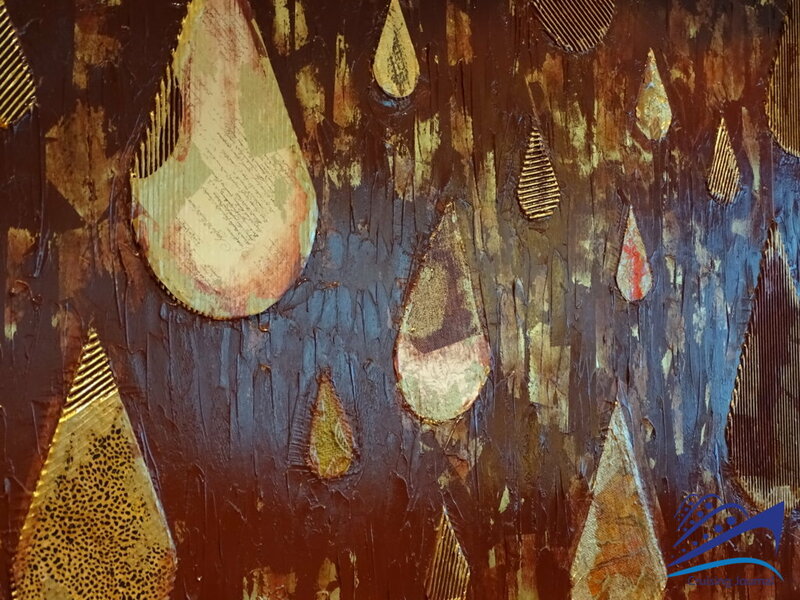 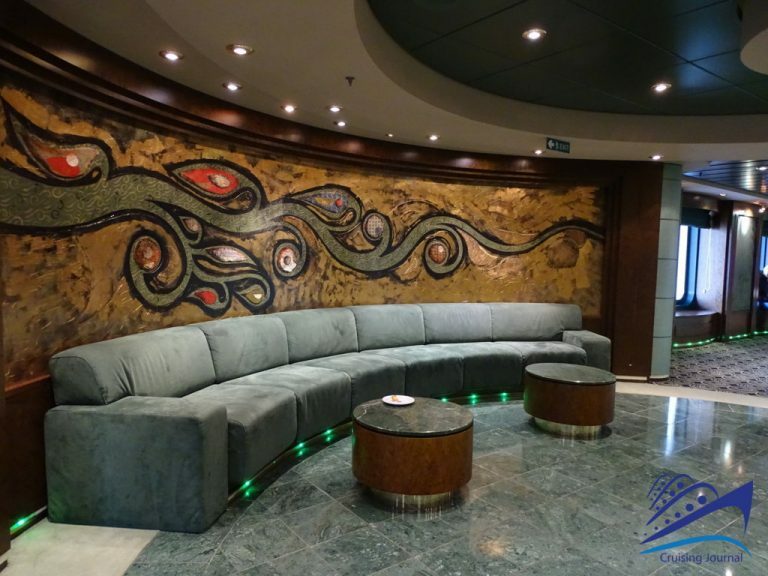 The interior decoration is elegant and cozy, played on warm and enveloping tones, with a good distribution of environments and services. 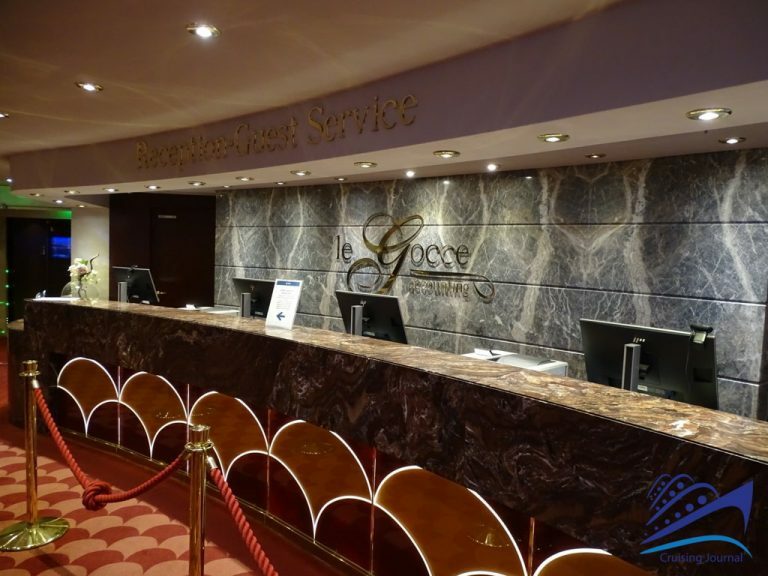 Around the central lobby, served by the Bar Le Gocce, there is the Reception and the Accounting Reception. 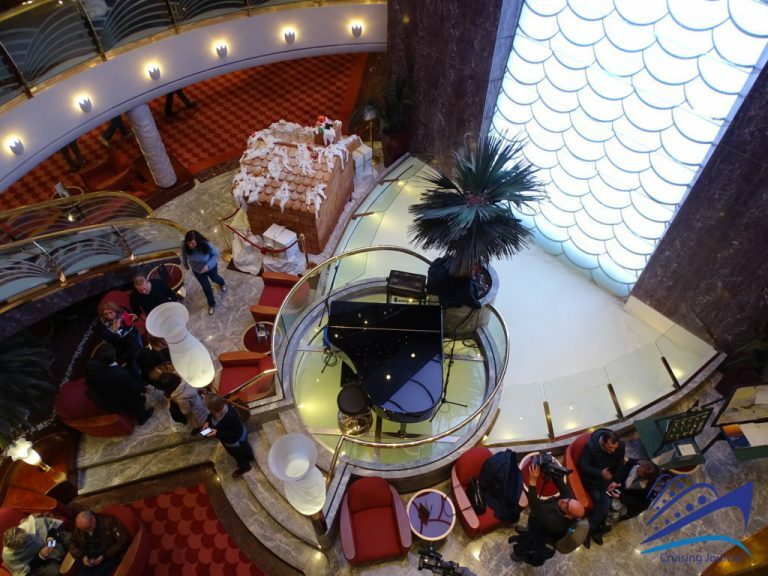 The piano in the center of the Atrium makes it the ideal place for an aperitif or an evening drink. 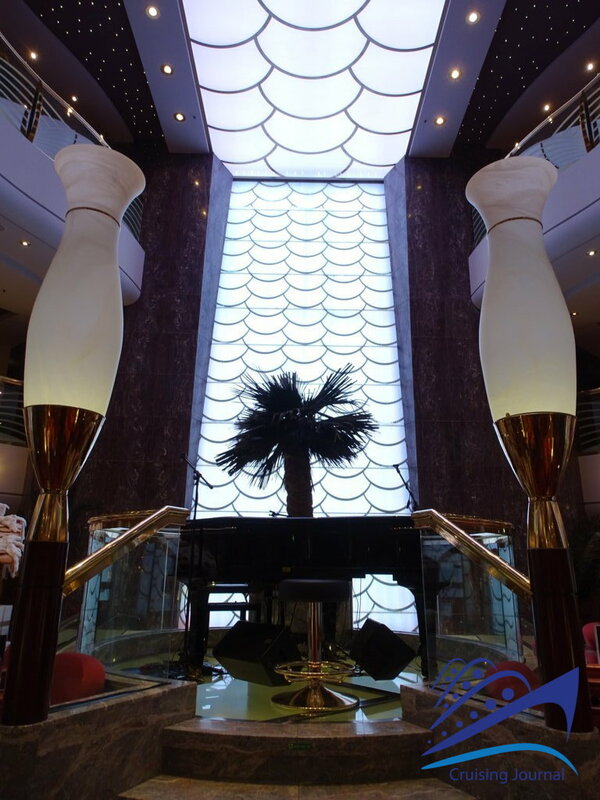 The balconies of the 6 Portofino and 7 Amalfi decks also overlook the Lobby. 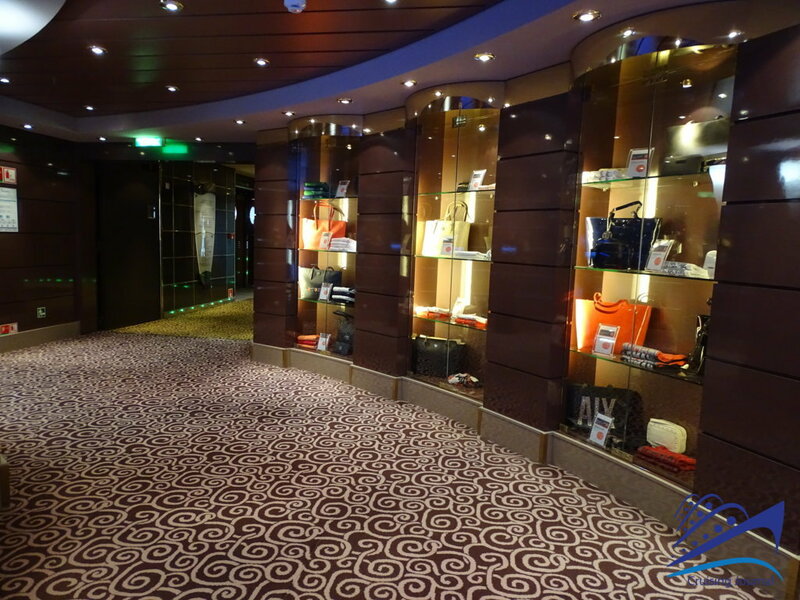 On the first are the Bond Street Boutiques on the left side, the Msc Travel Agency and Il Rubino Jewelry on the straight side. 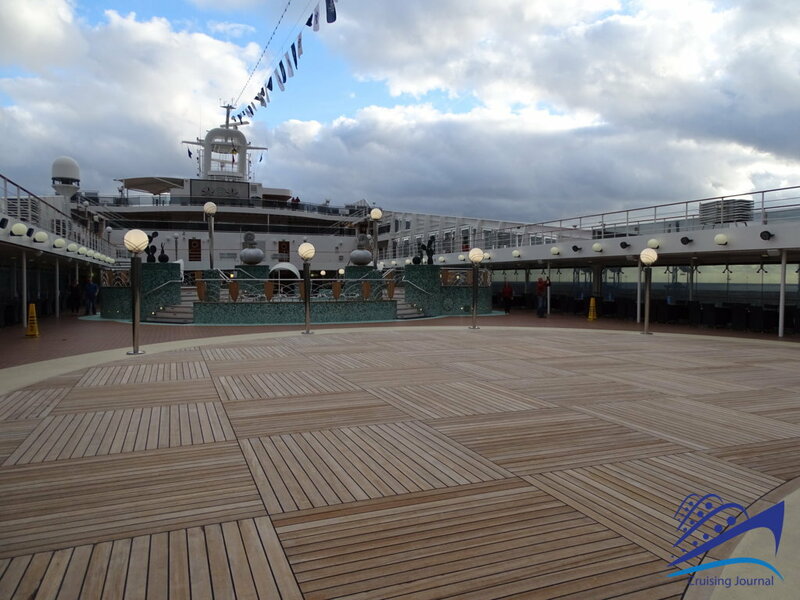 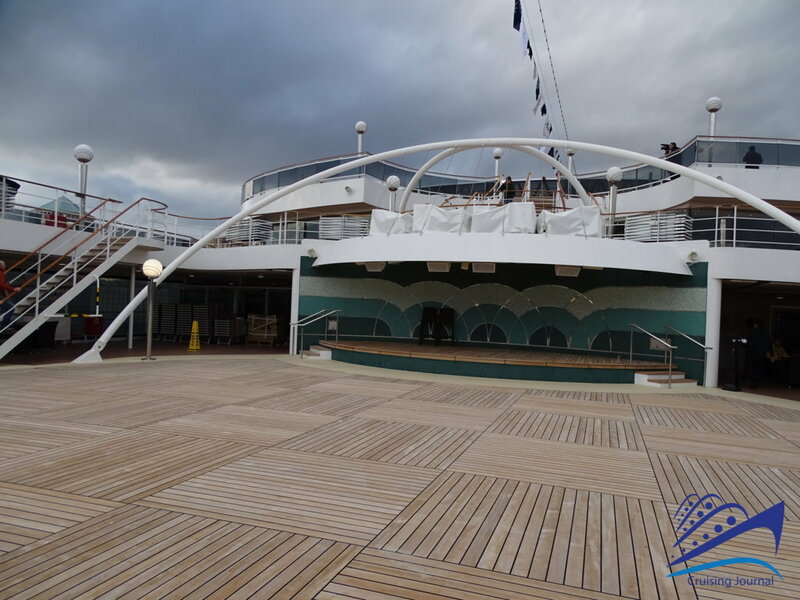 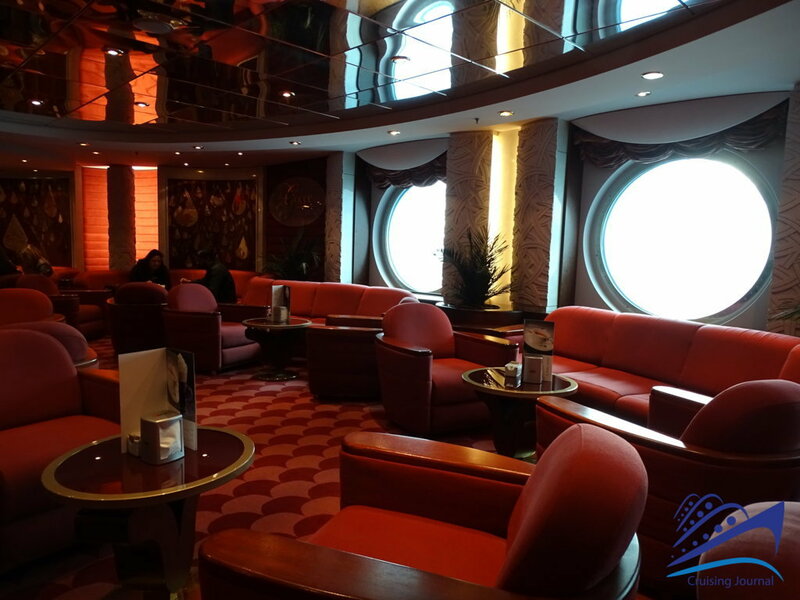 On the upper deck there is the Cyber Café on the left and the Cuba Lounge Cigar Bar on the straight side. 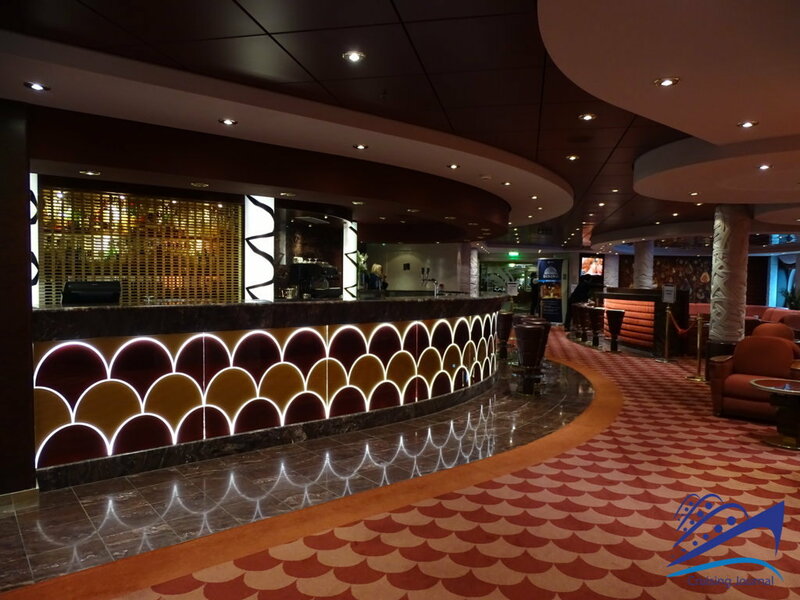 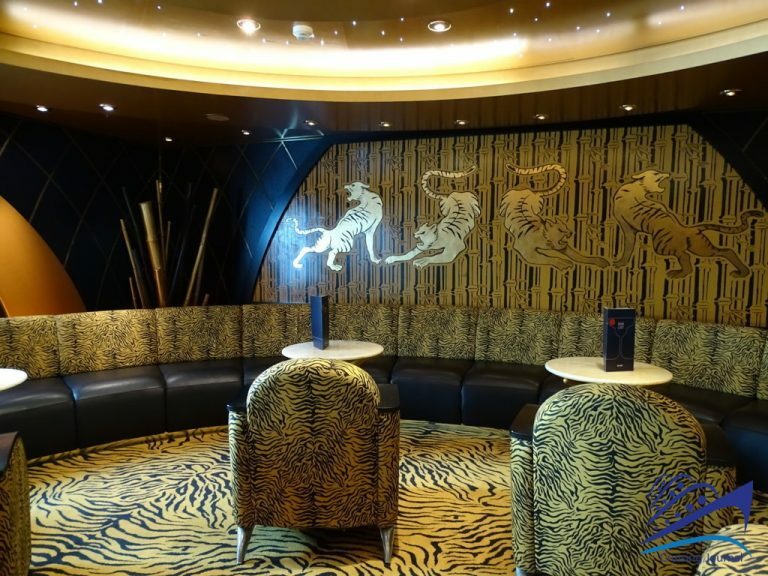 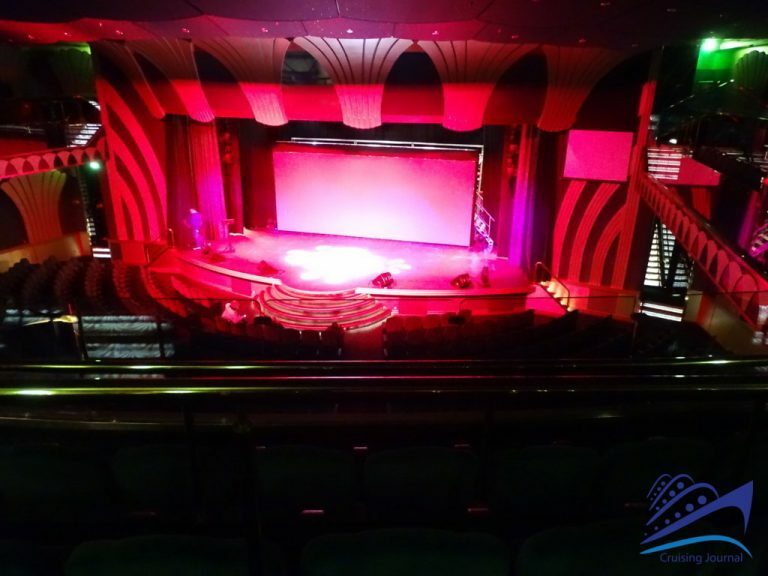 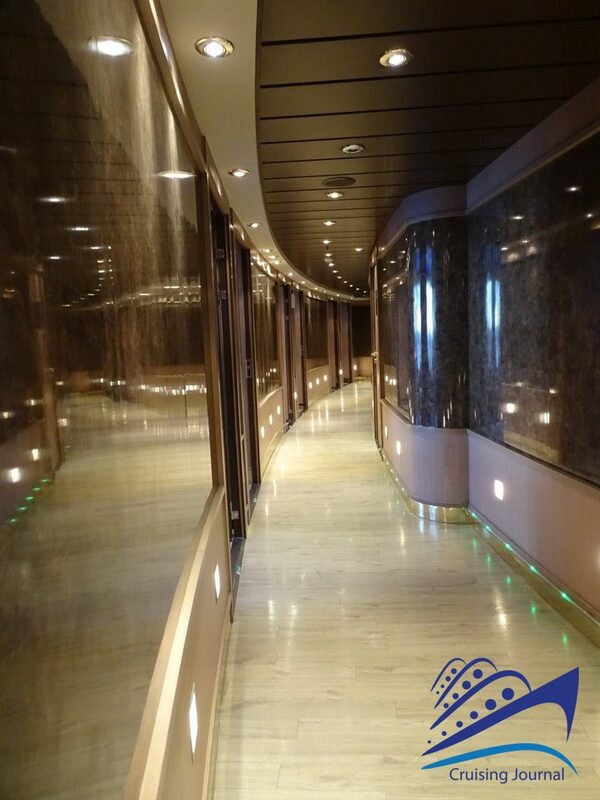 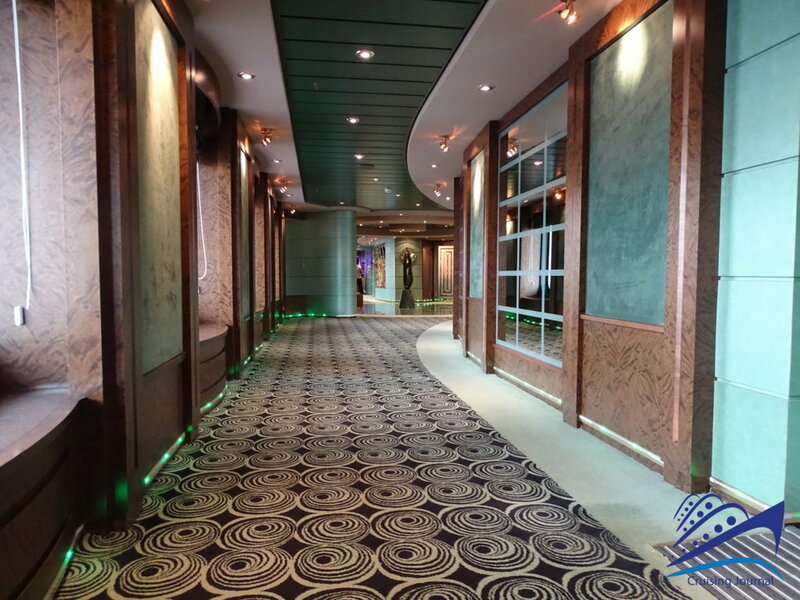 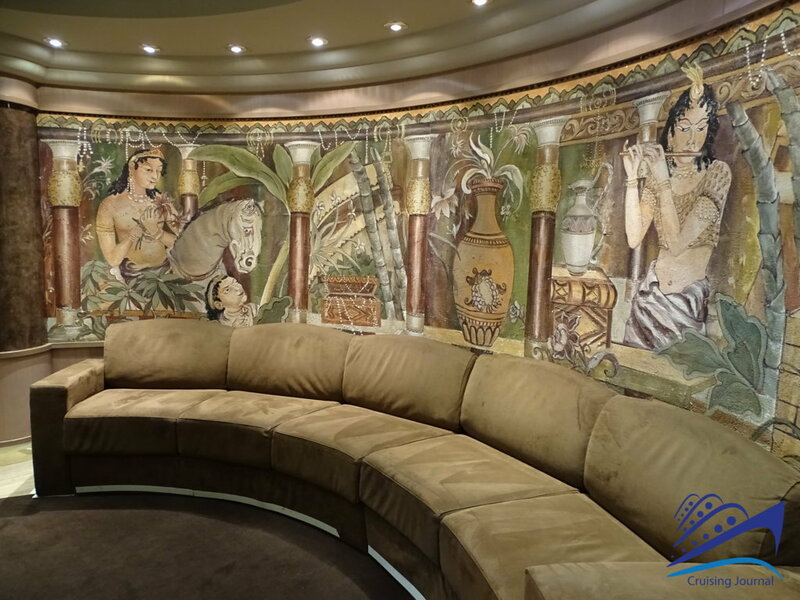 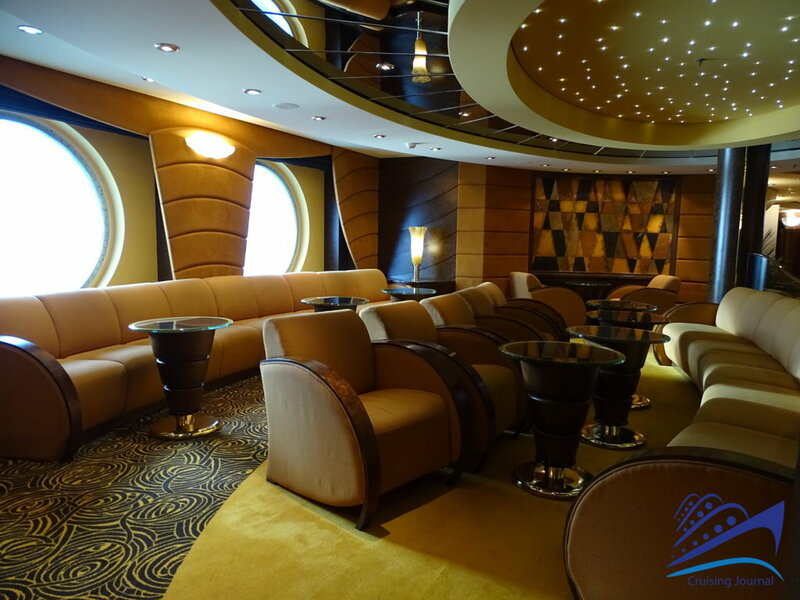 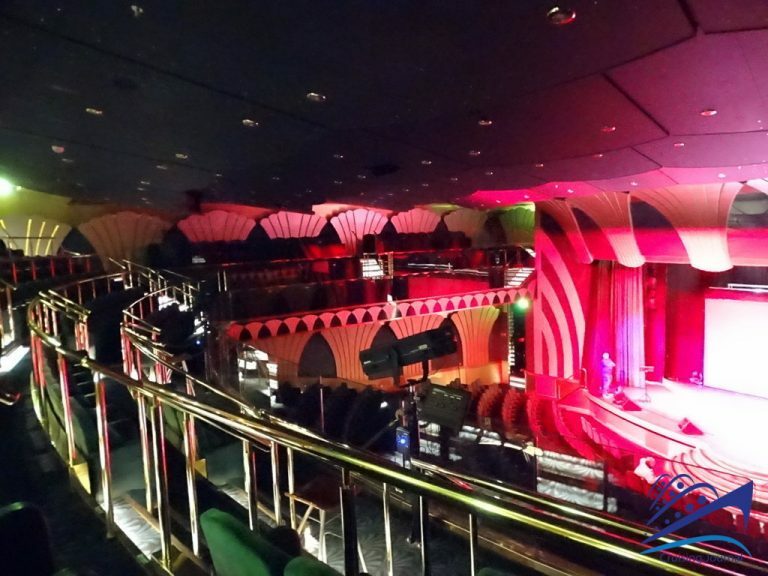 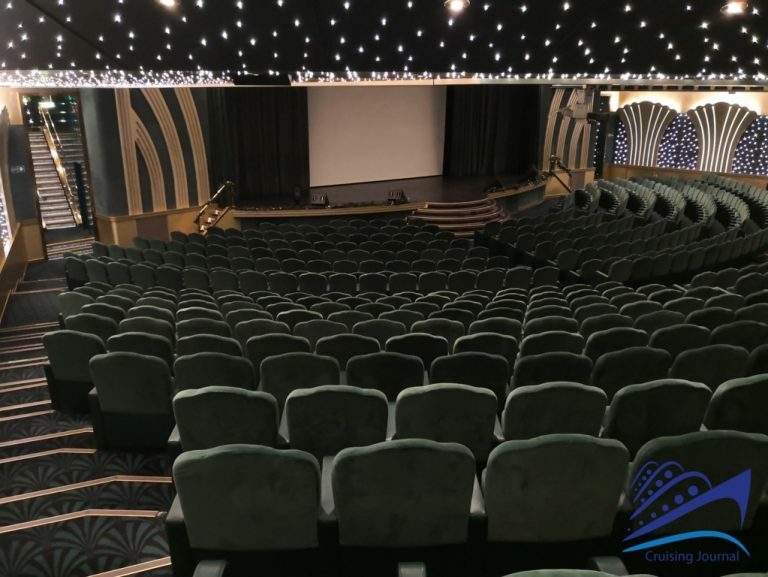 The Royal Theatre, located on decks 5, 6 and 7 at the bow, is very beautiful, spacious and very elegant. 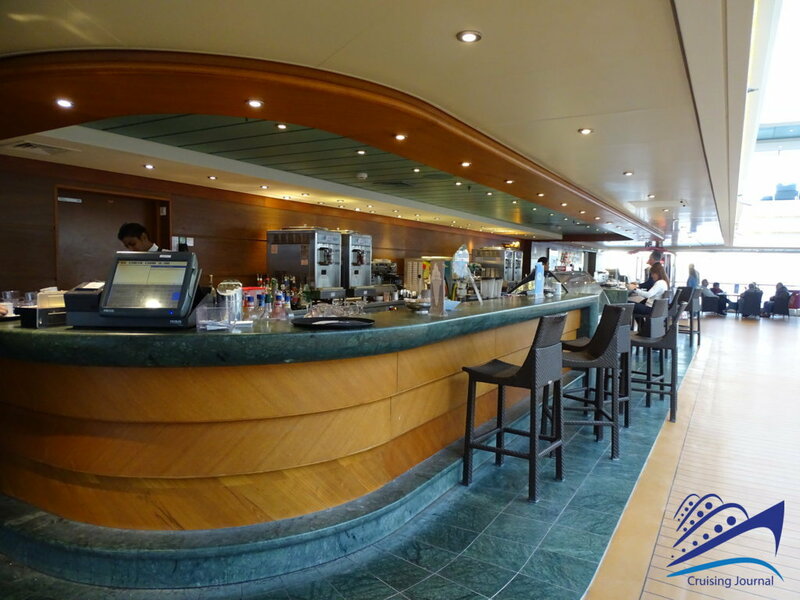 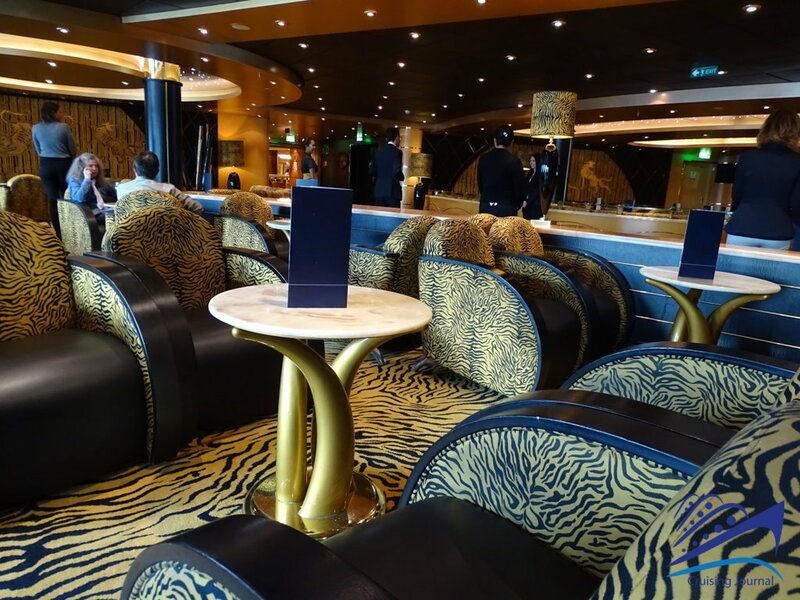 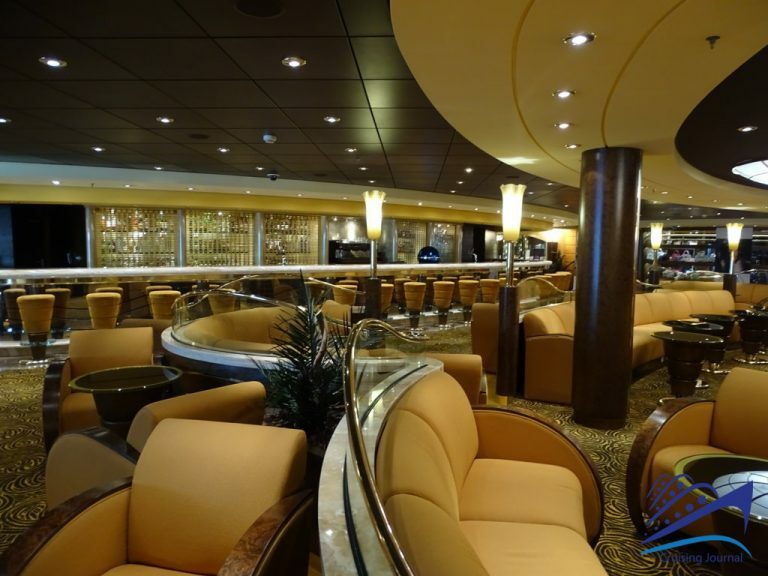 On deck 6 there are other lounges available to passengers. 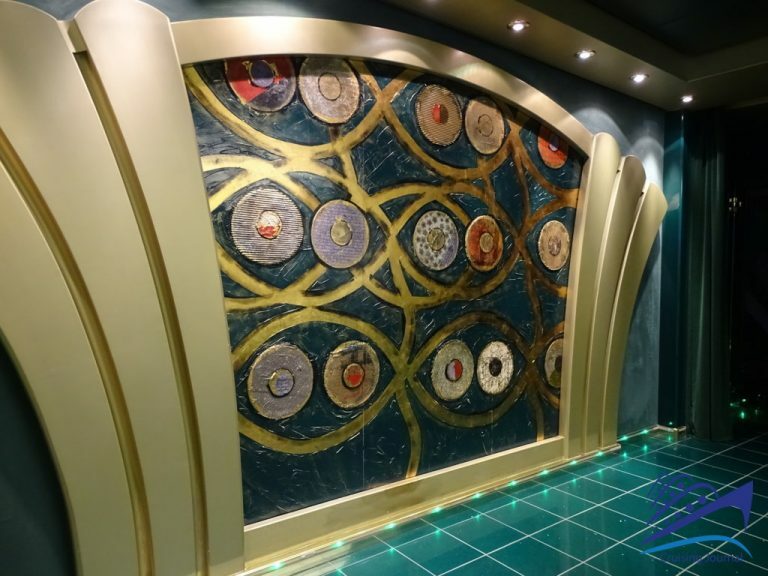 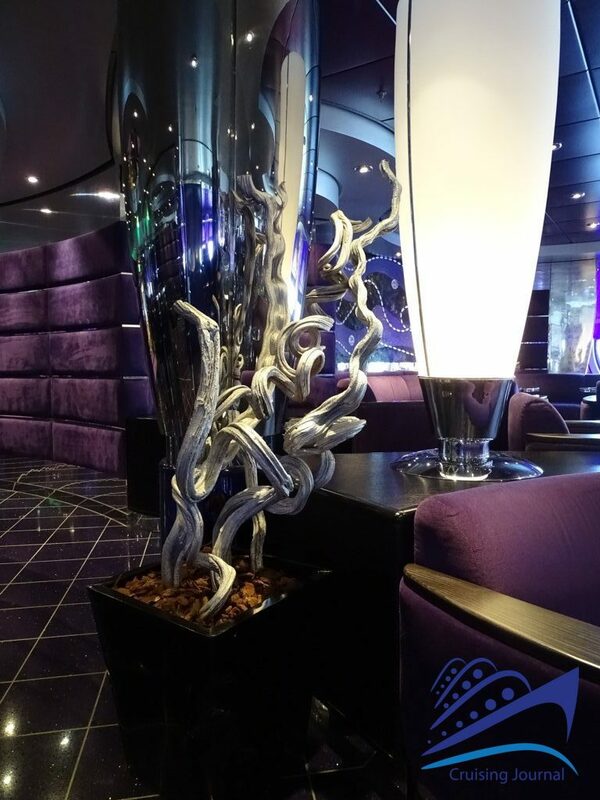 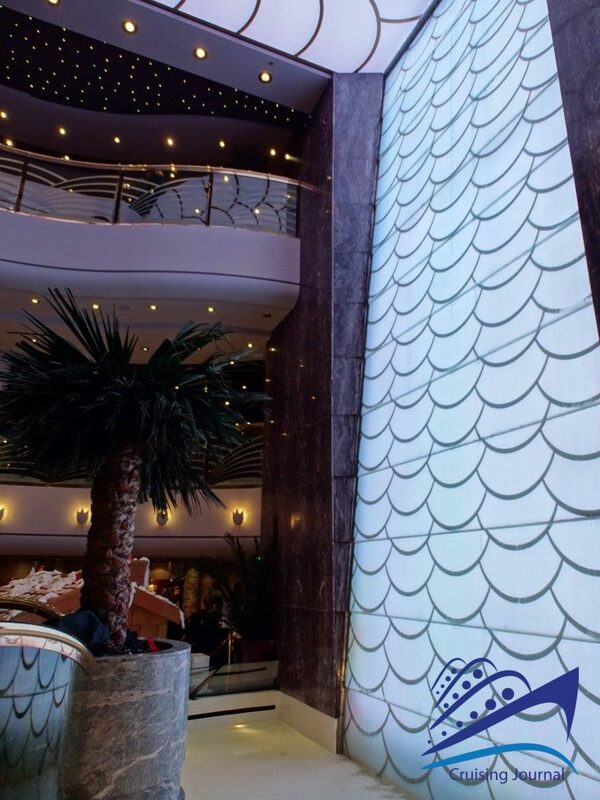 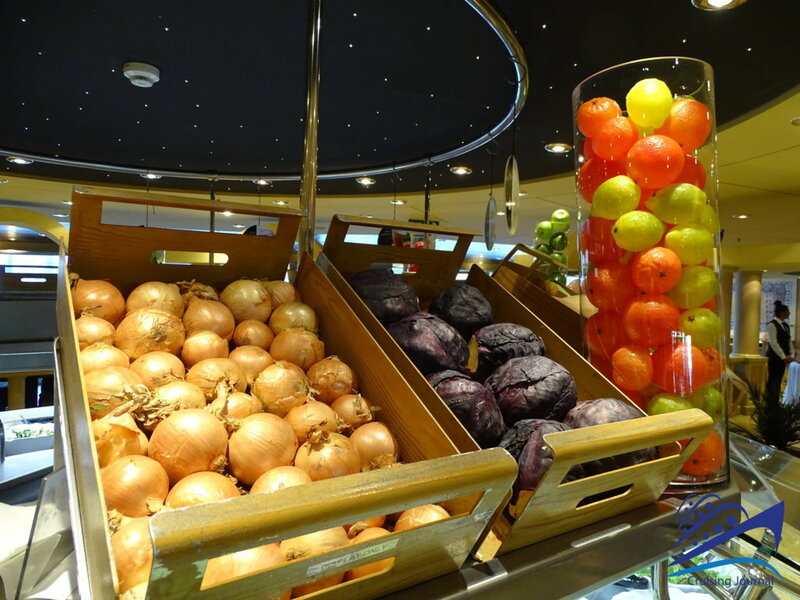 In the middle of the ship, the Purple Bar and the Ruby Bar can be found; they are small and are located near the Atrium. 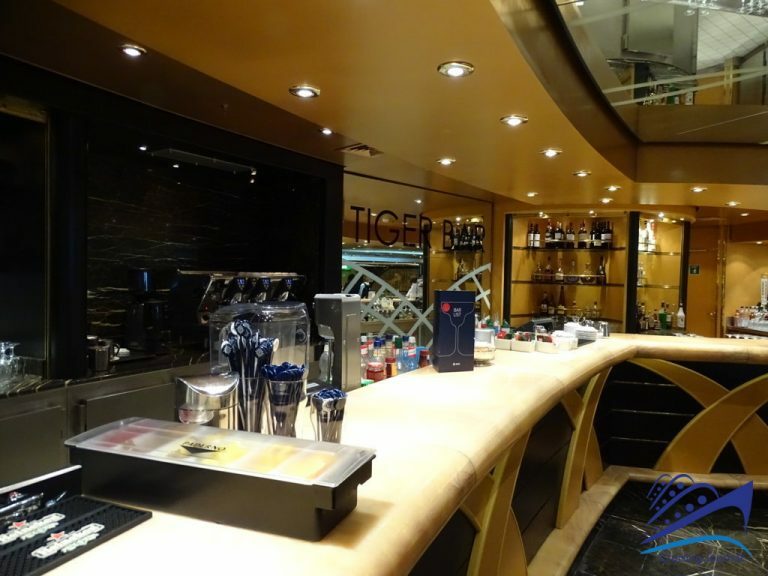 Larger and always very animated are the Topazio Bar and the Tiger Bar, which follow one another moving towards the bow. 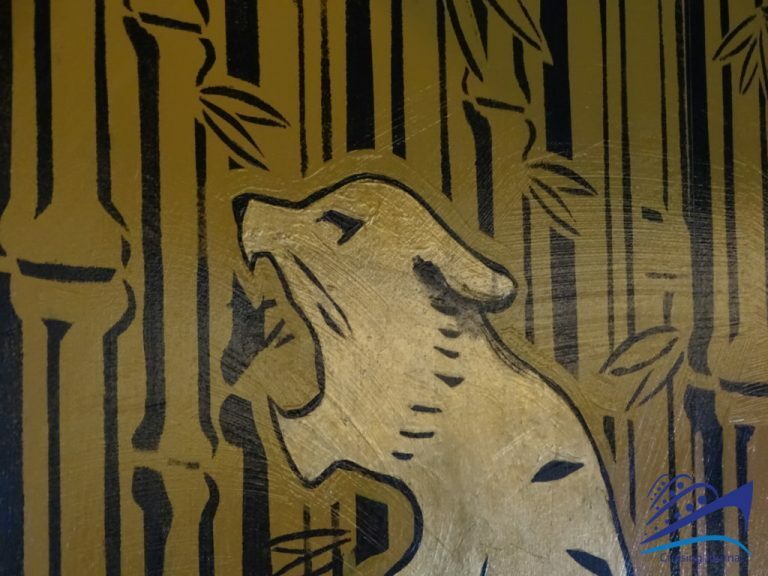 Golden and elegant colours for the former, themes of the savannah and tigers everywhere for the latter, but both very welcoming. 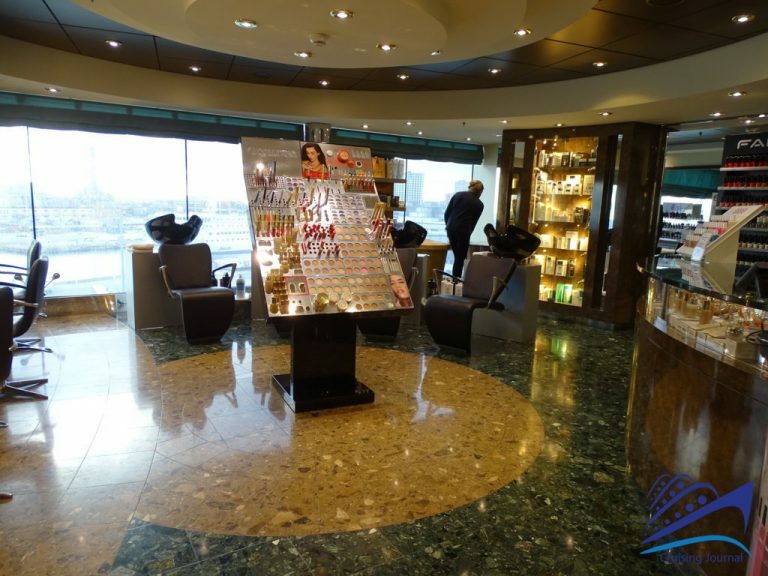 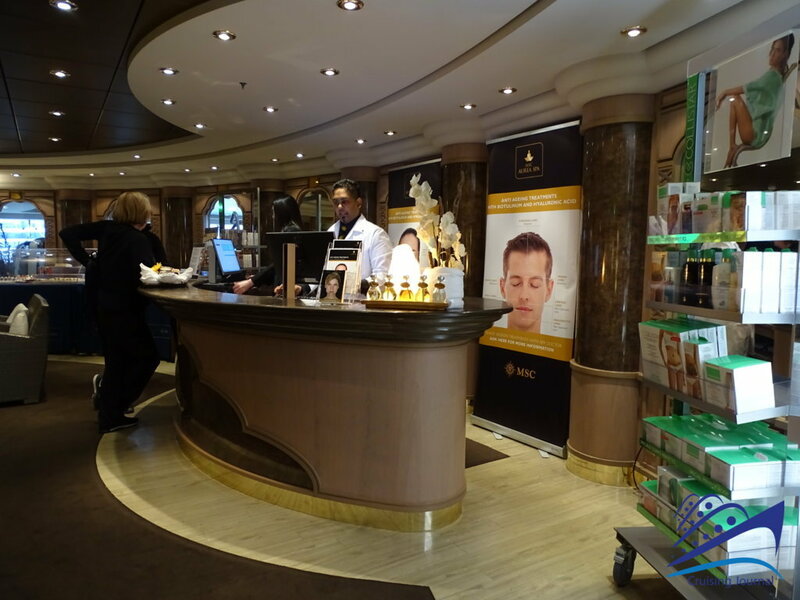 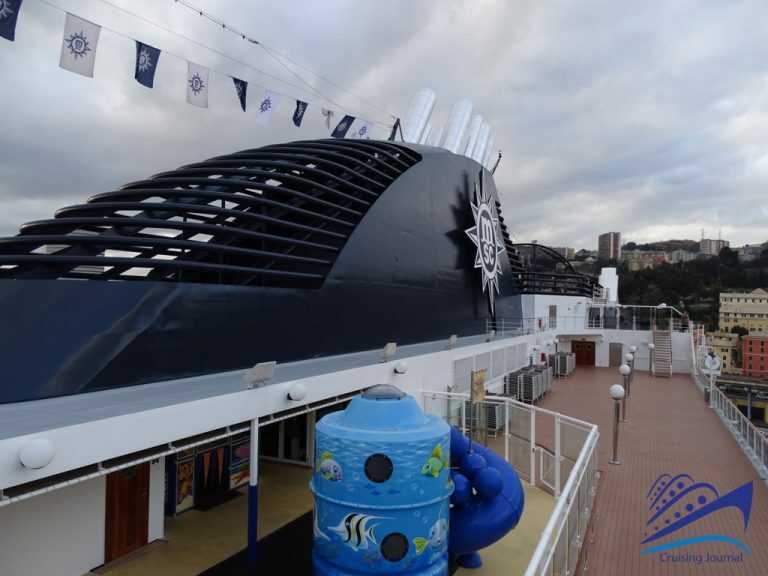 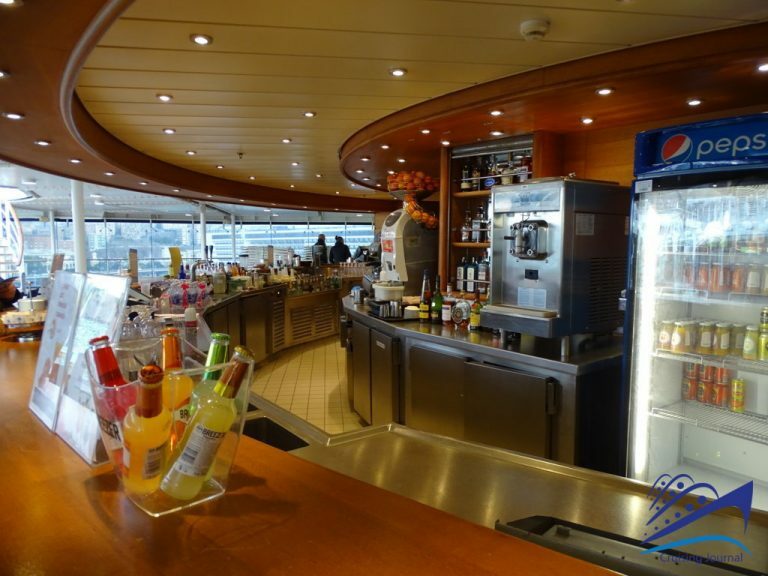 On both sides of the Topazio Bar are also some of the shops on board: Le Parfum, Msc Logo Shop on the left ship, and The Mini Mall and L’Angolo dell’Oggetto on the right side. 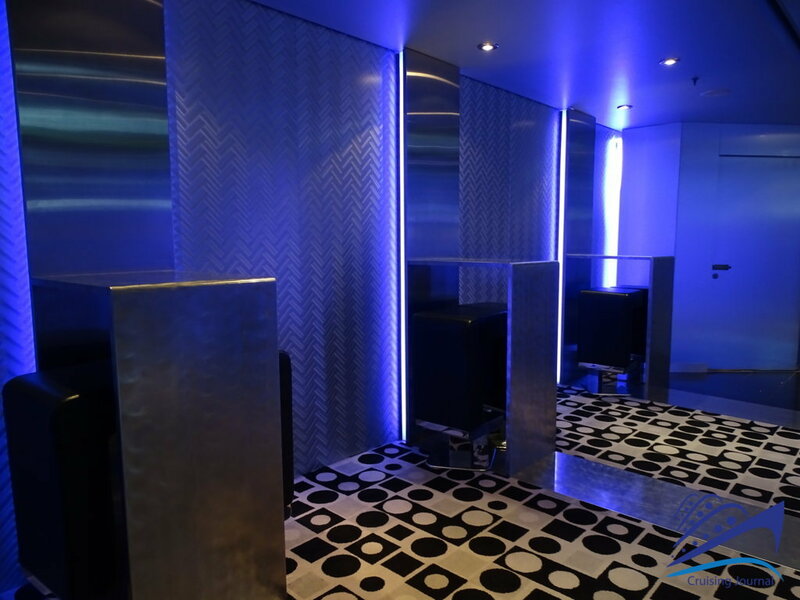 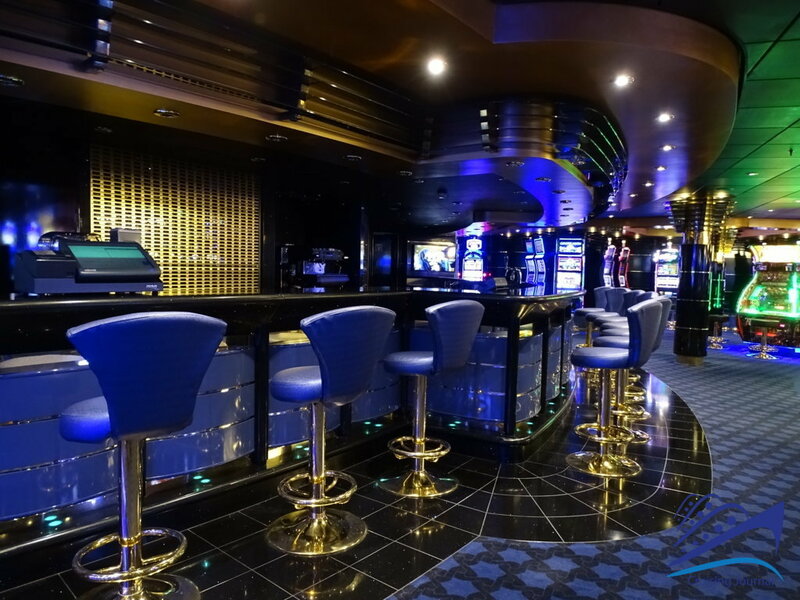 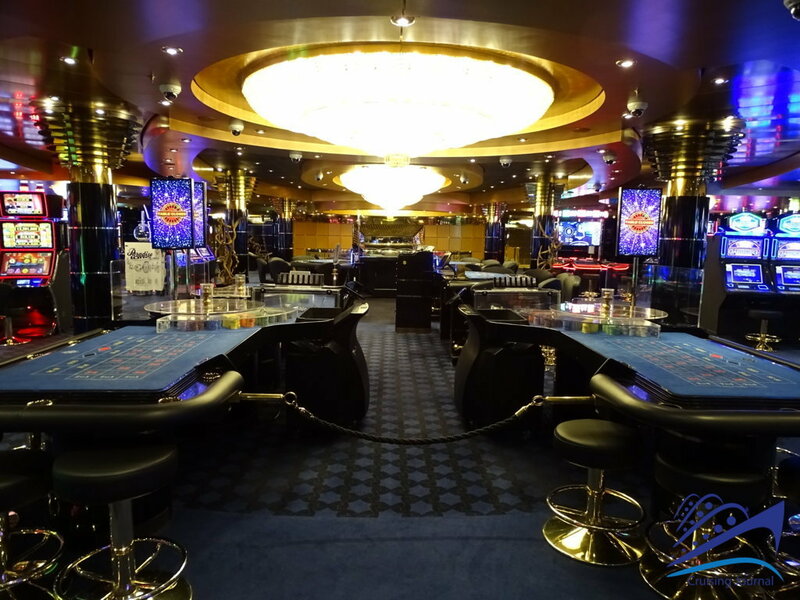 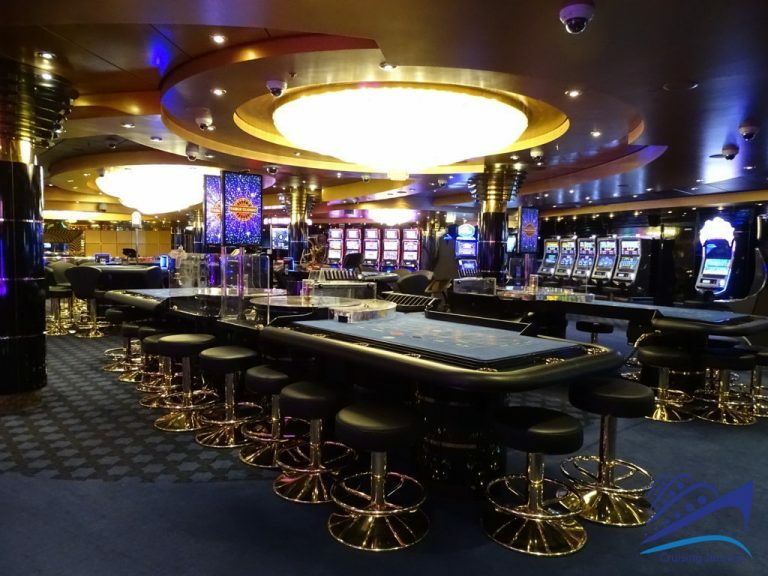 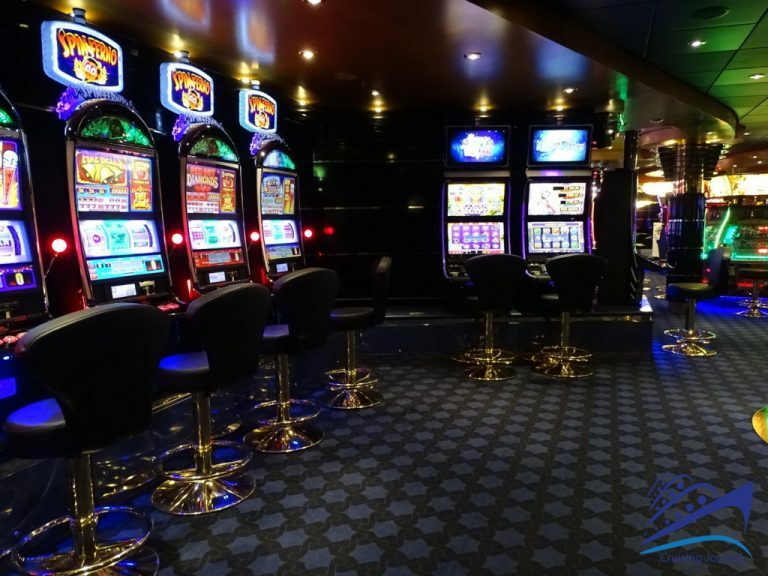 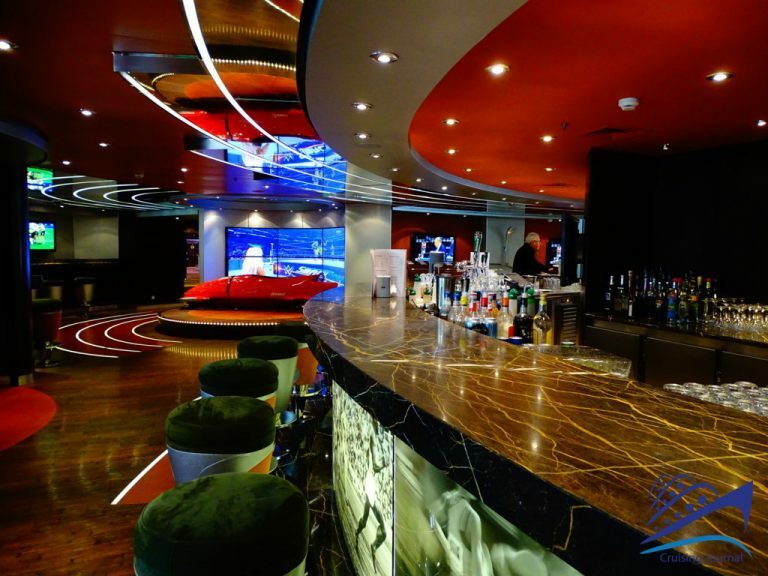 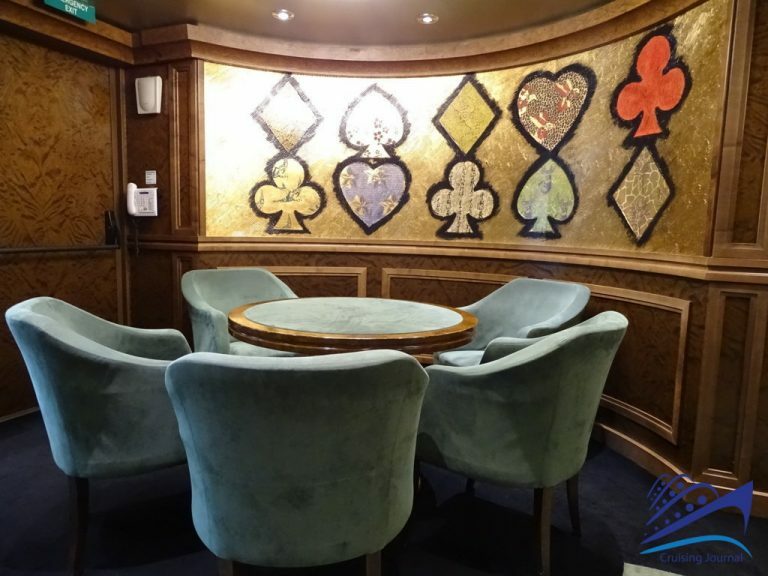 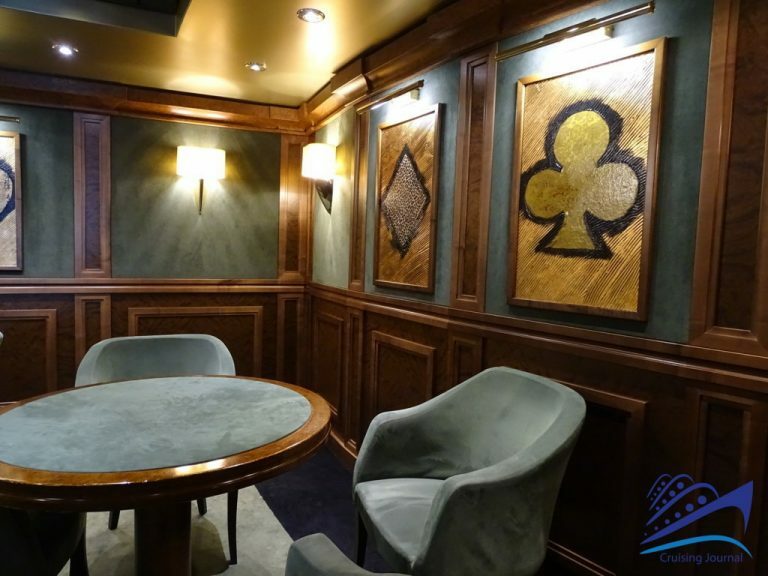 On deck 7, proceeding from the theatre towards the stern, you will find the large Atlantic City Casino, with its own bar and smoking area. 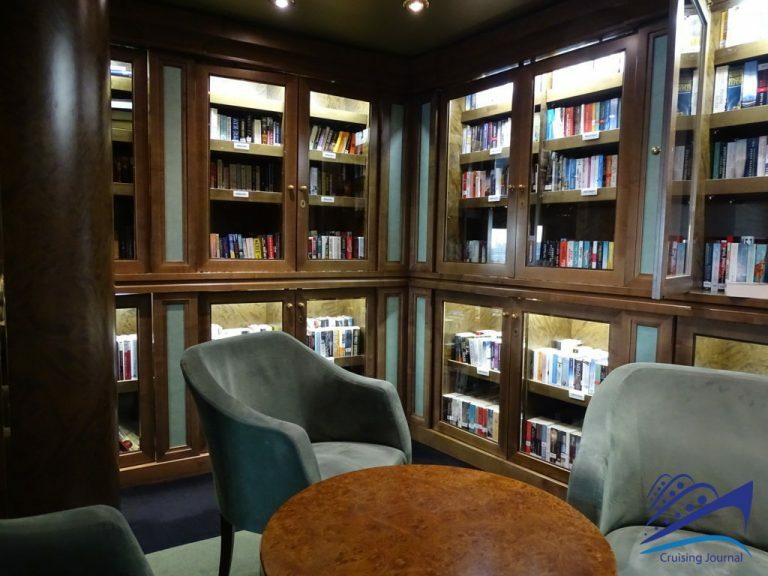 Continuing on the pleasant walk on the deck you will find the Library, rather well stocked with books in various languages, and the Card Room, nicely decorated with the seeds of playing cards. 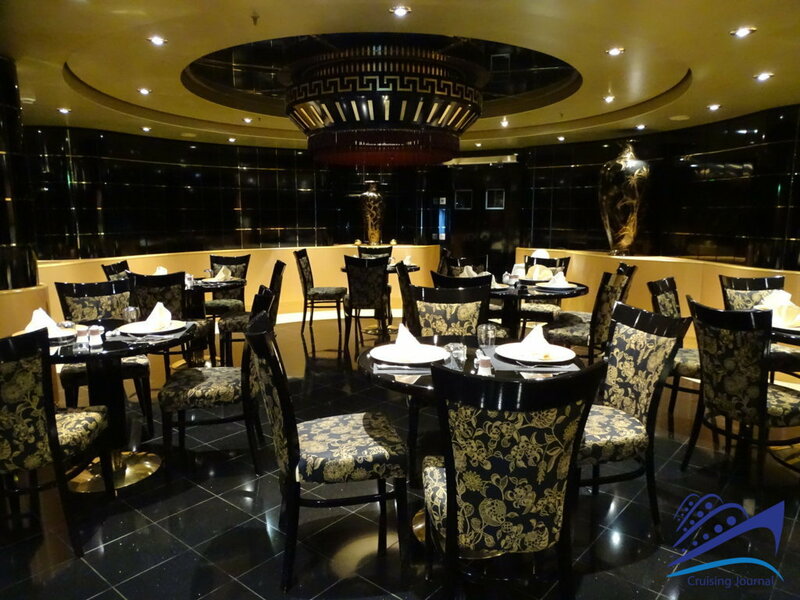 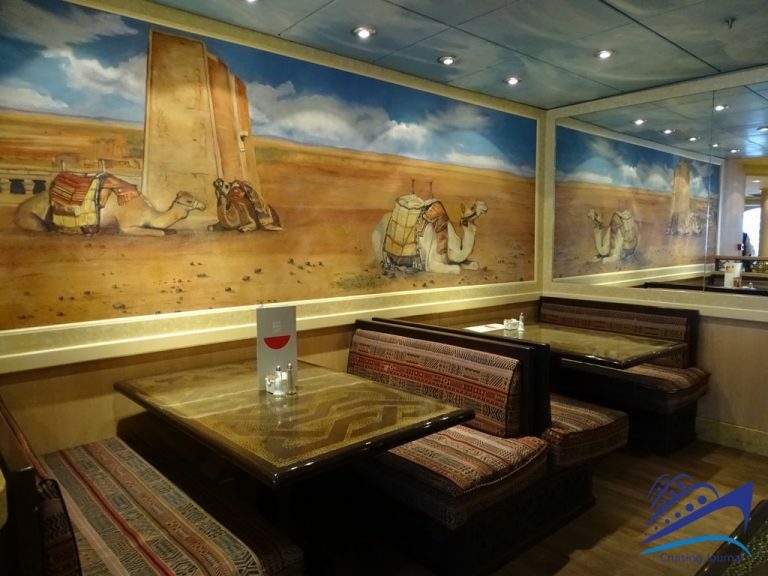 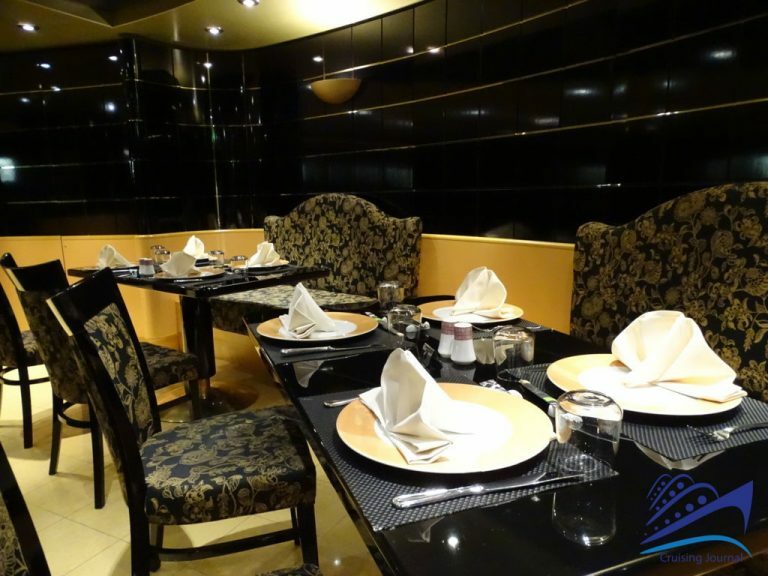 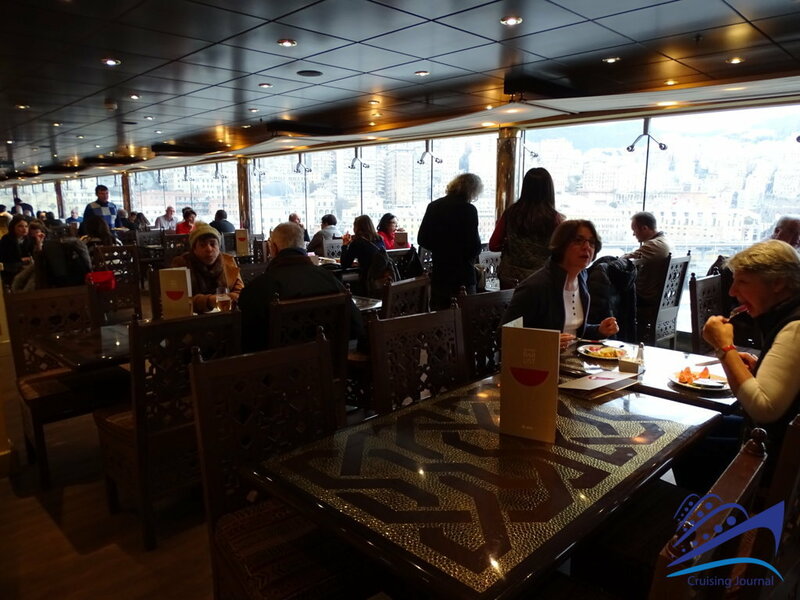 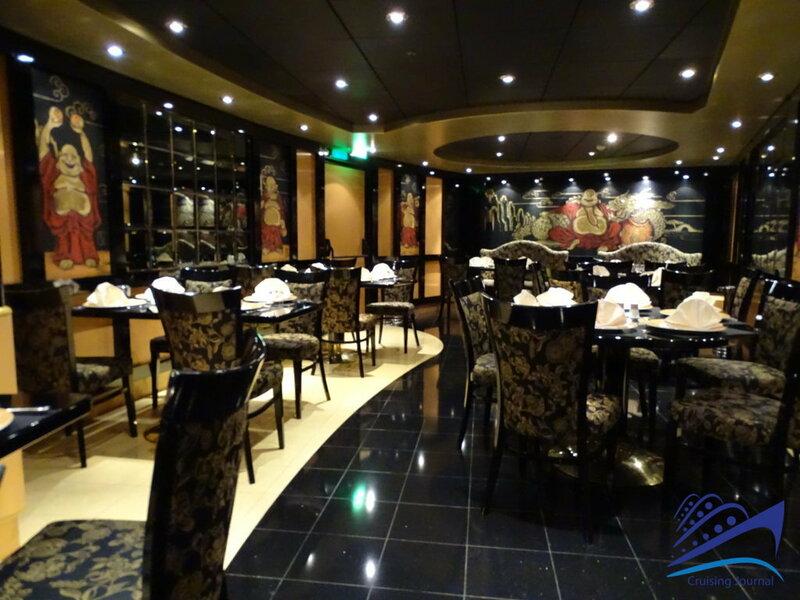 Opposite, the on-board specialty restaurant, Oriental Plaza, is dedicated to oriental cuisine and decorated with a theme, with dark tables and golden decorations. 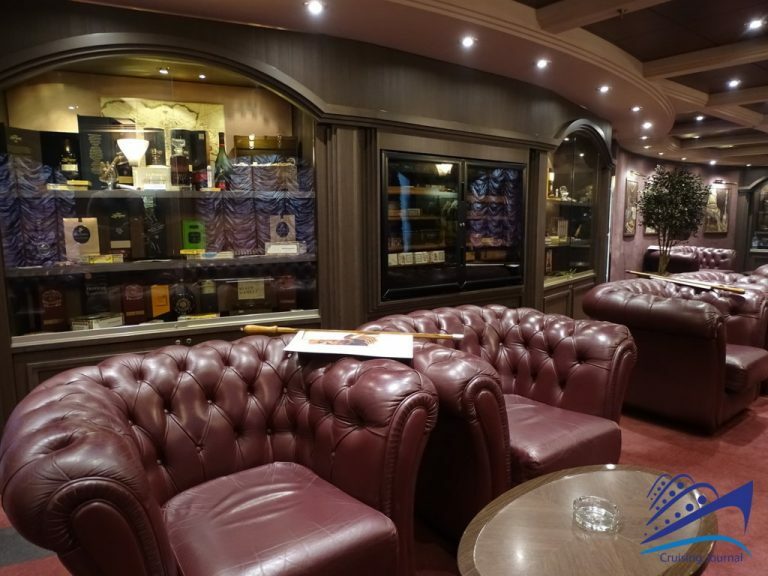 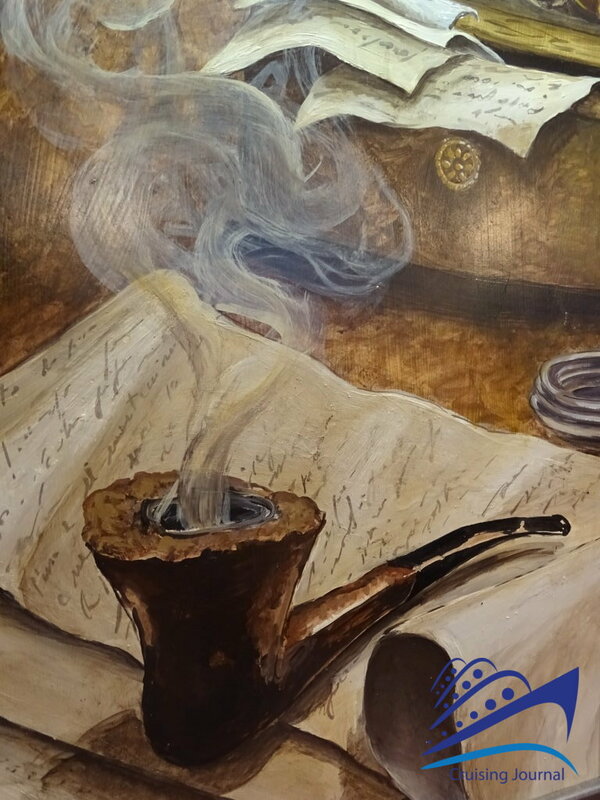 From here smokers can move to the Cuba Lounge Cigar Bar, the ideal place for a good cigar or a distillate, from the menu proposed inside. 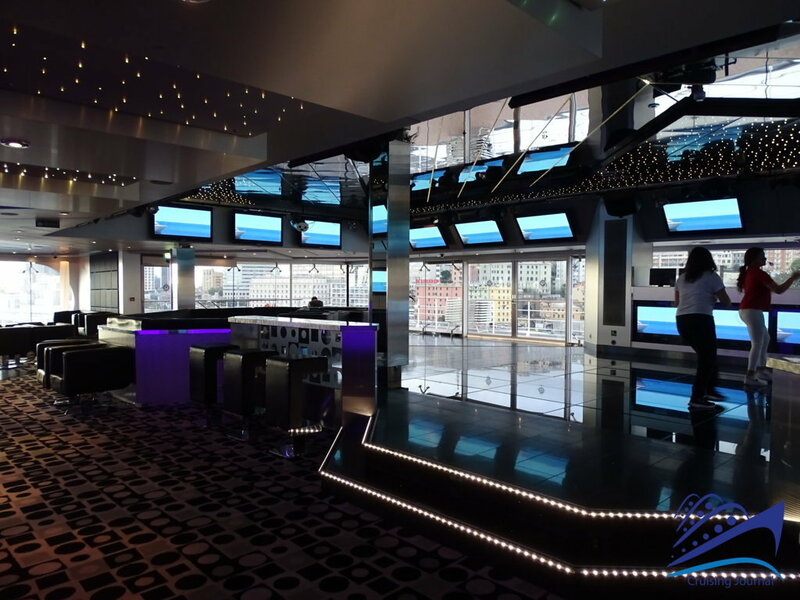 A few more steps towards the stern and you’ll come across the great L’Olimpiade Sporting Bar. 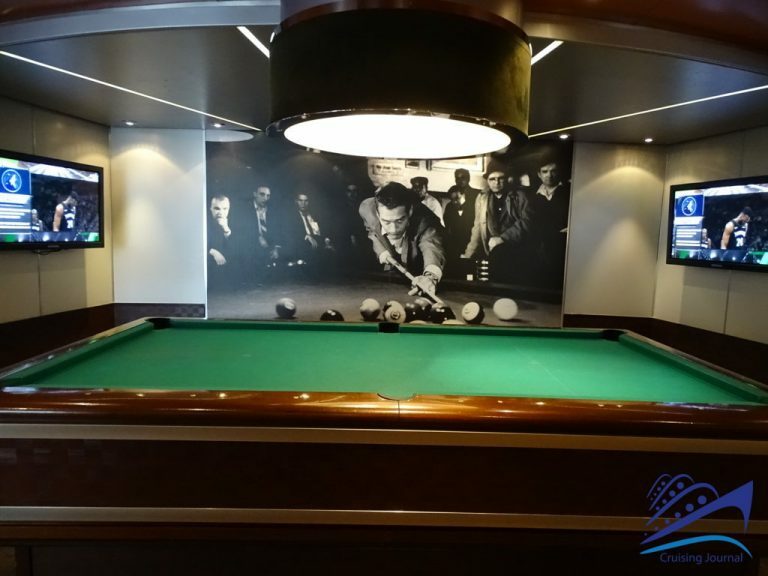 Not only sports furniture and screens, but also a pleasant place for every moment of the day, with a view of the sea and even equipped with a billiard table. 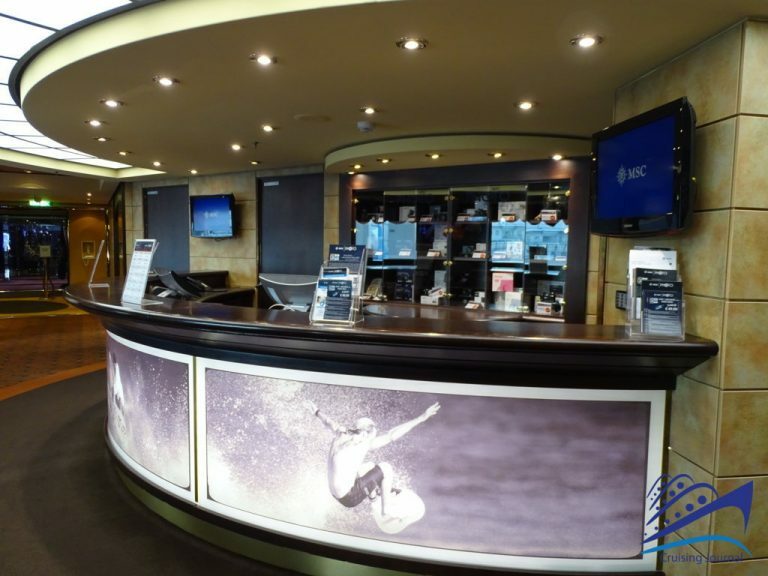 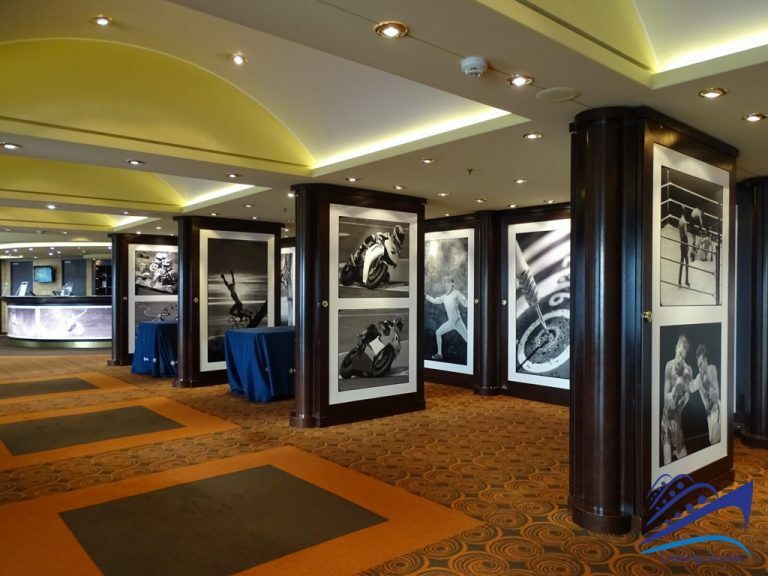 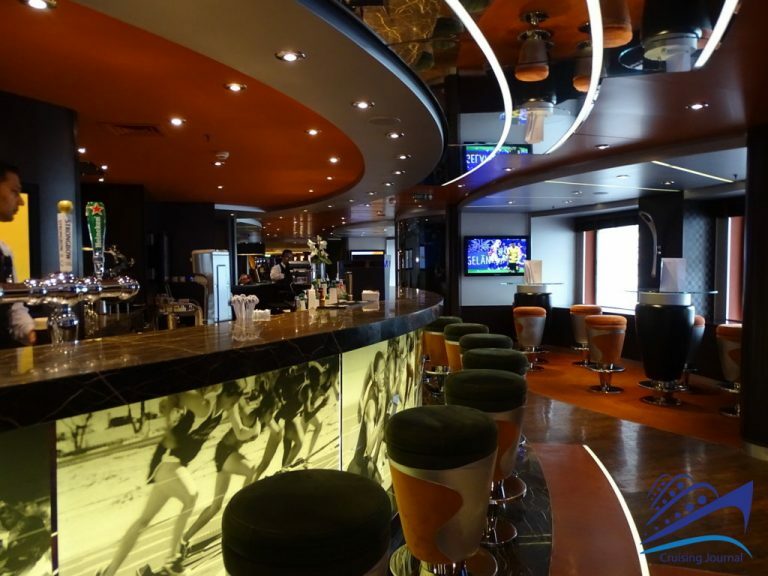 Photo Shop and Photo Gallery are located on the opposite side of L’Olimpiade Sporting Bar, with a well-stocked selection of photography items and a large gallery for displaying cruise photos. 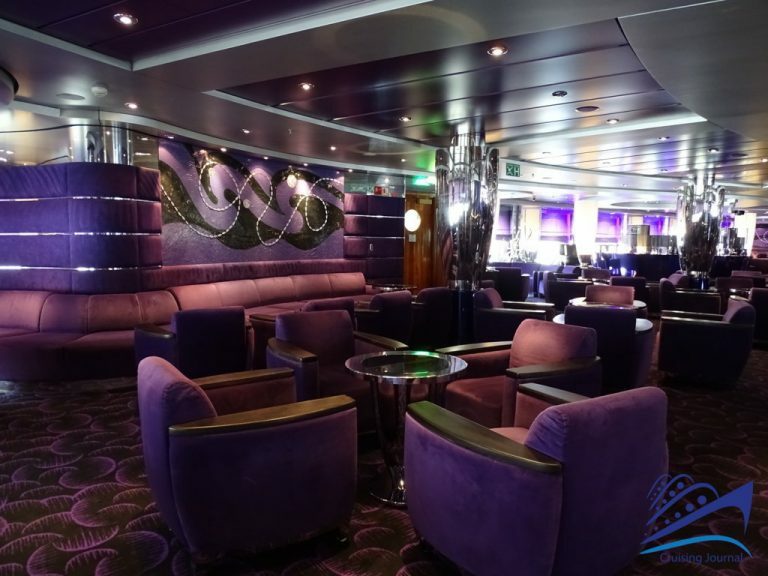 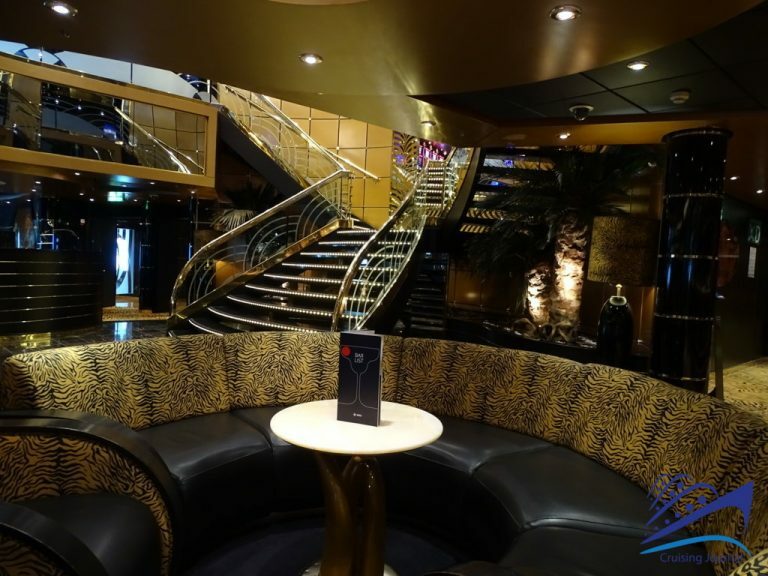 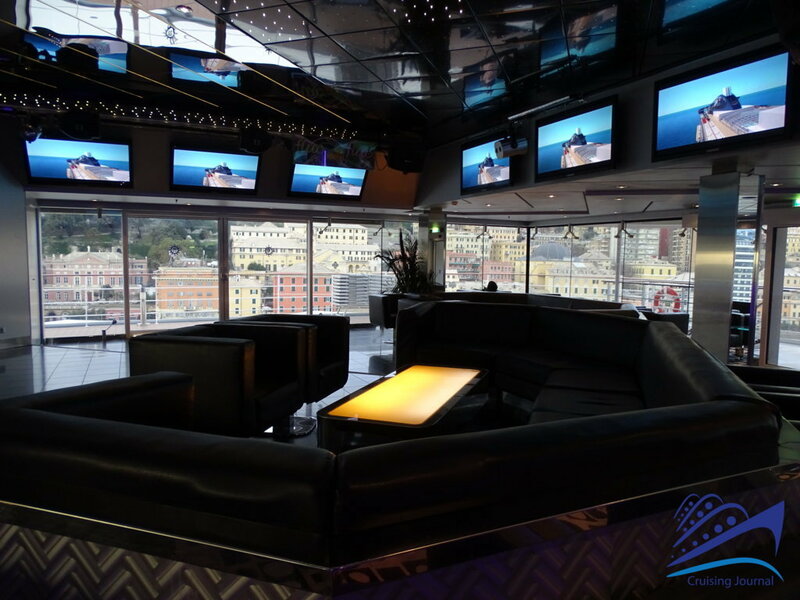 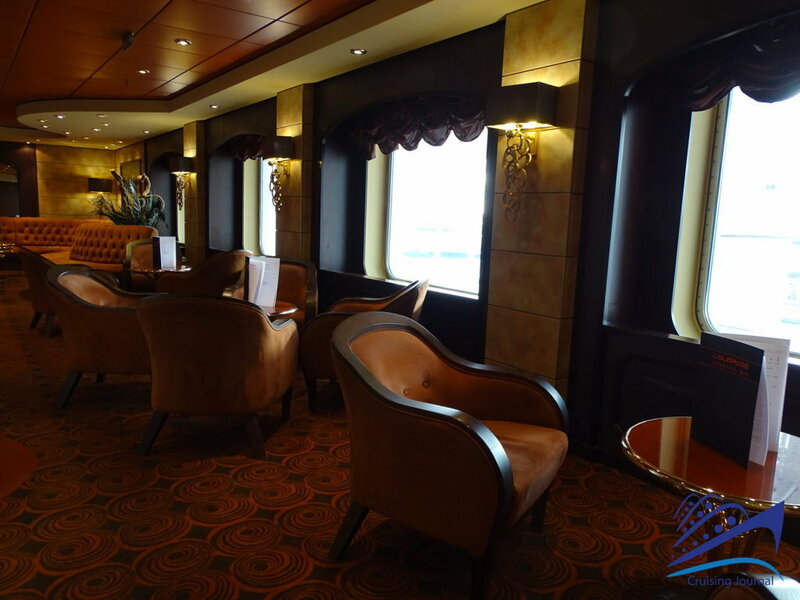 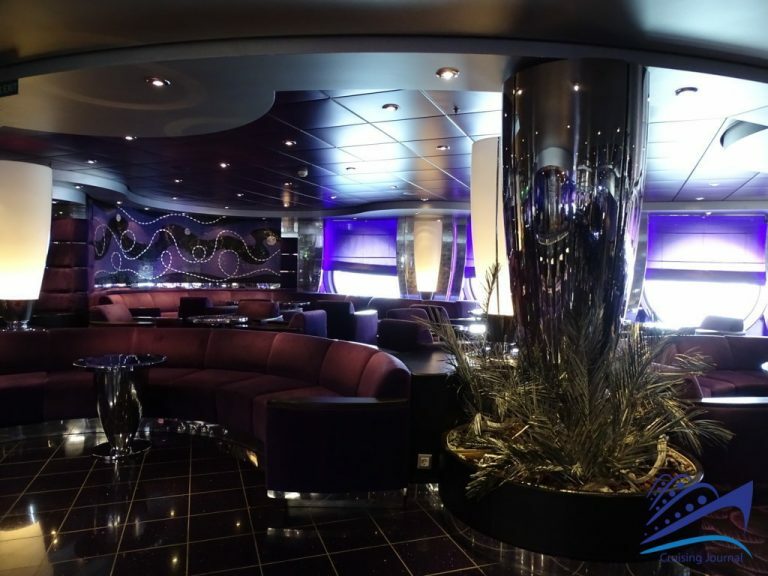 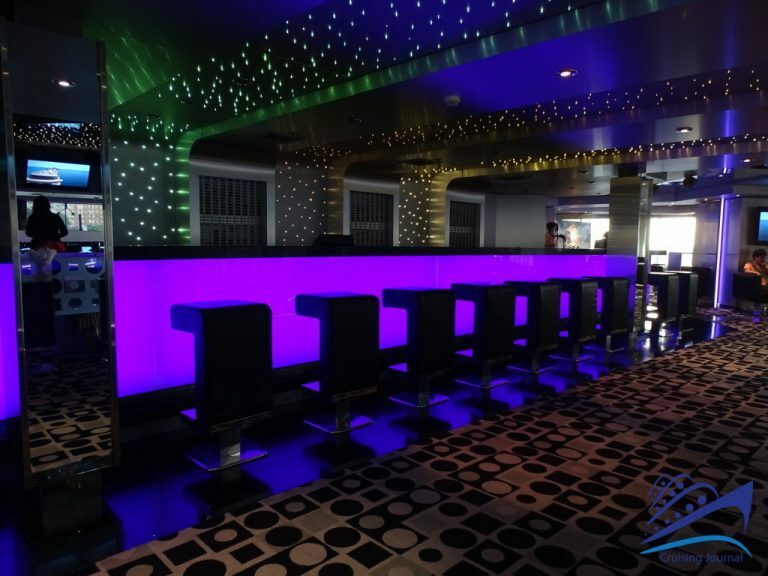 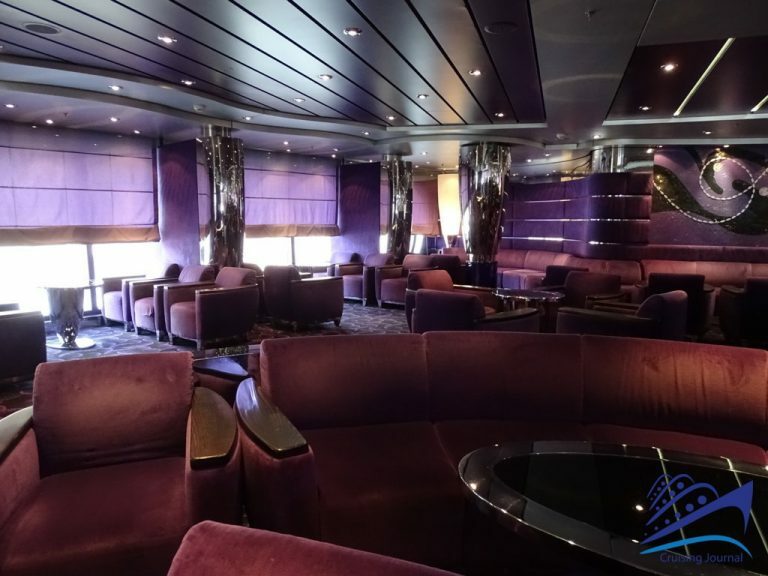 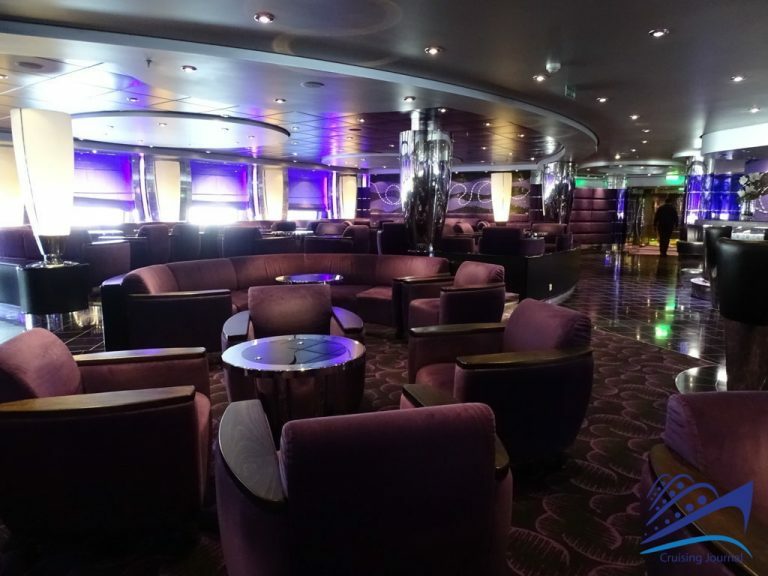 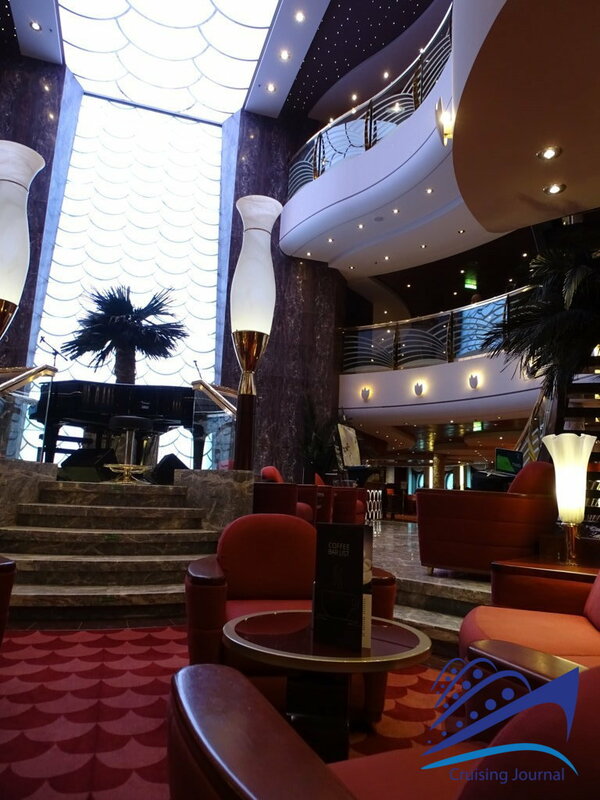 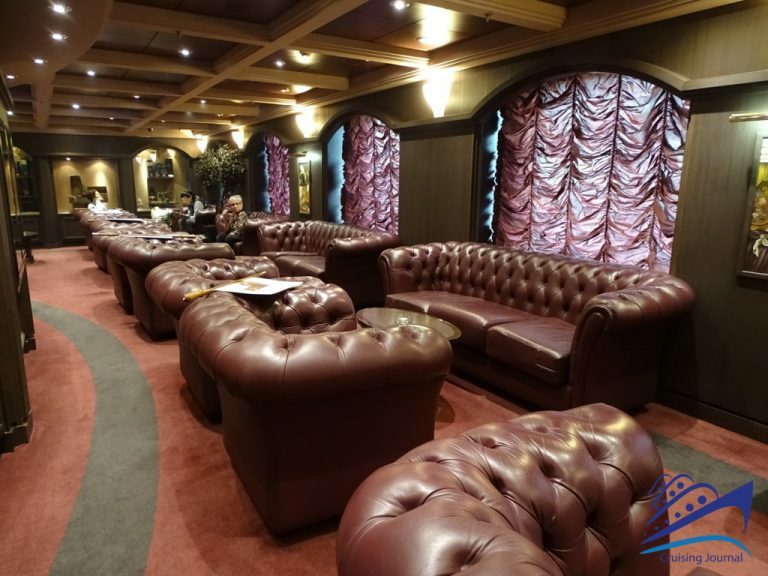 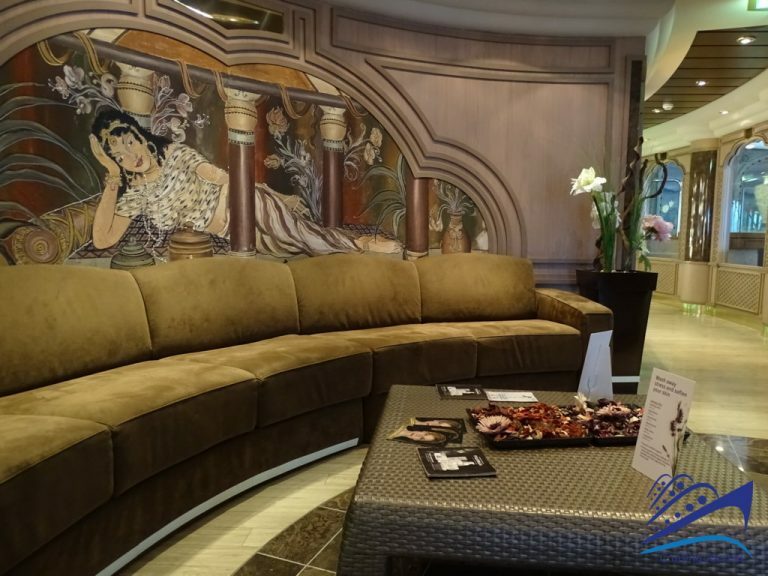 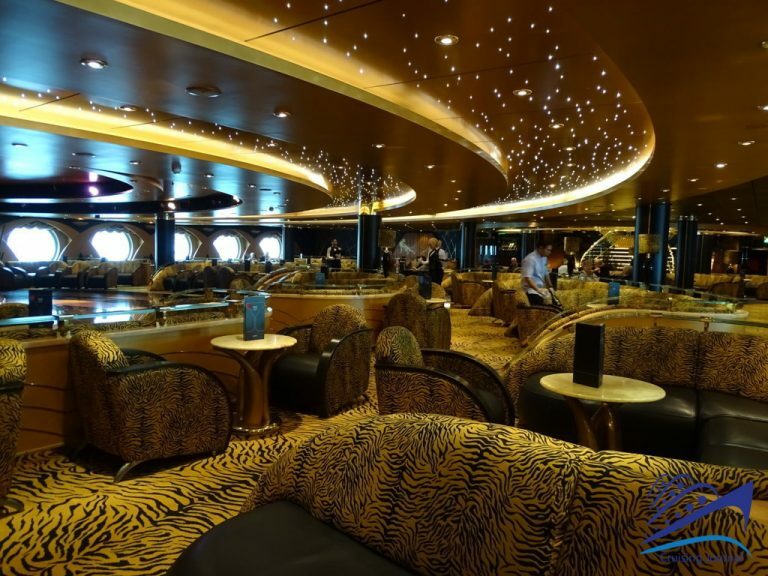 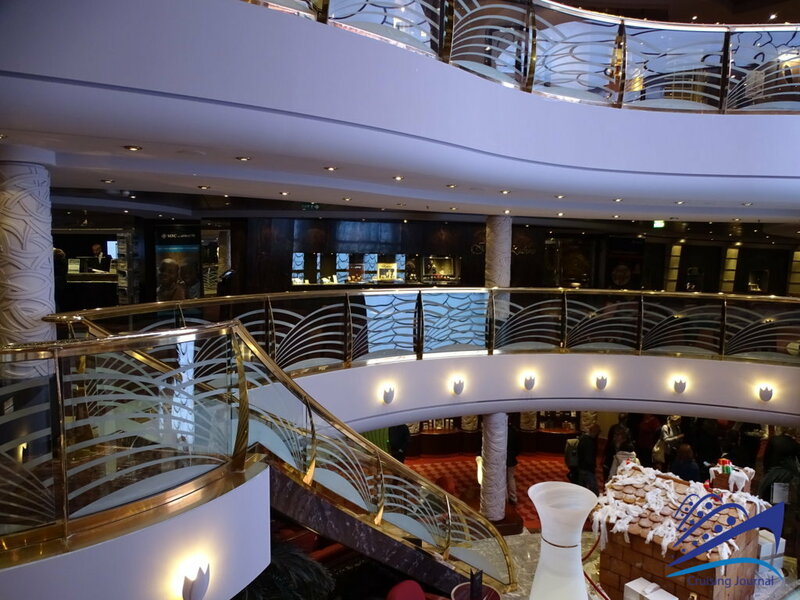 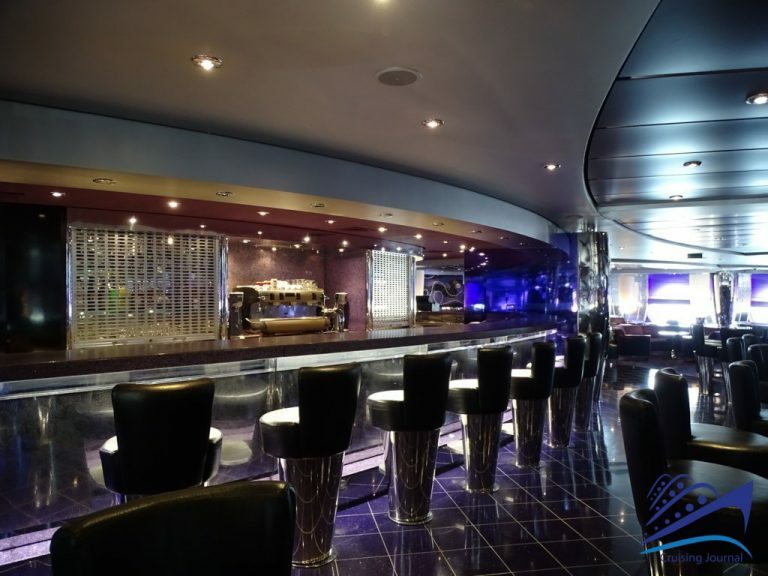 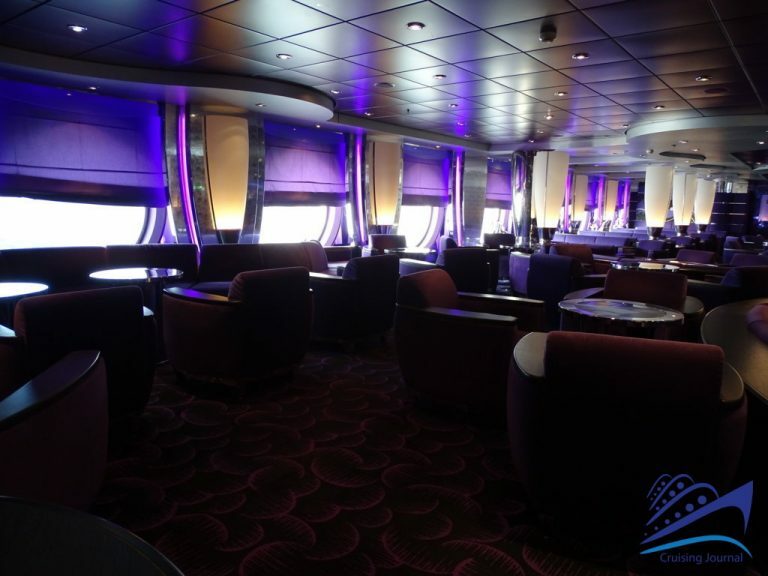 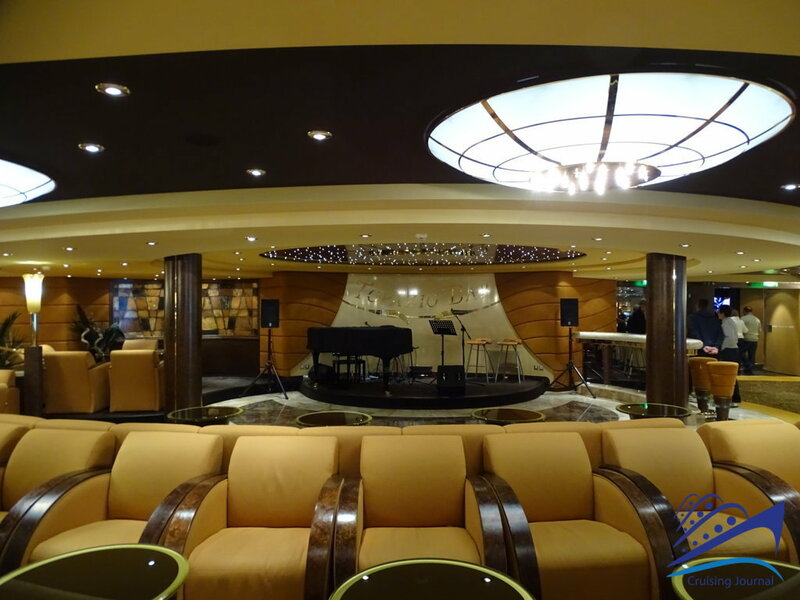 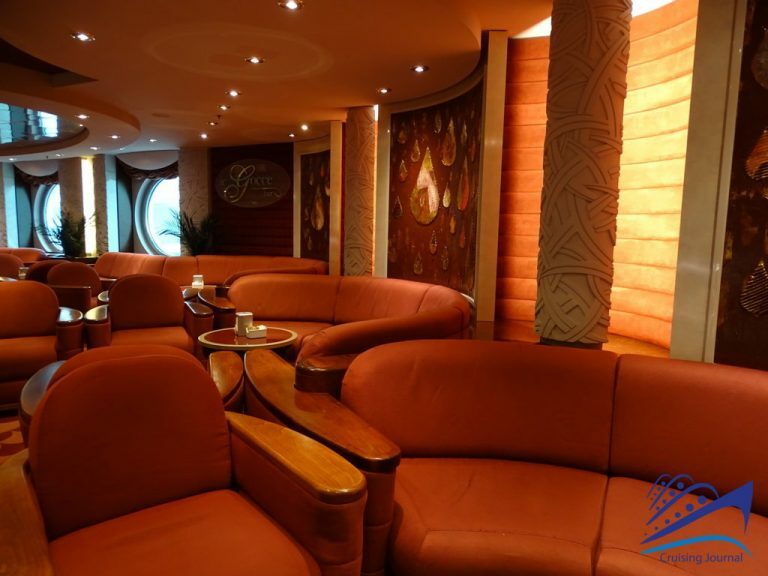 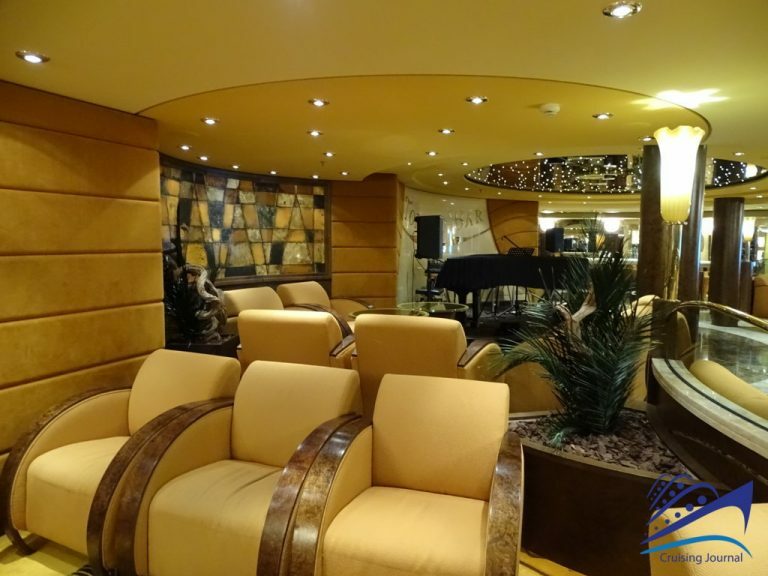 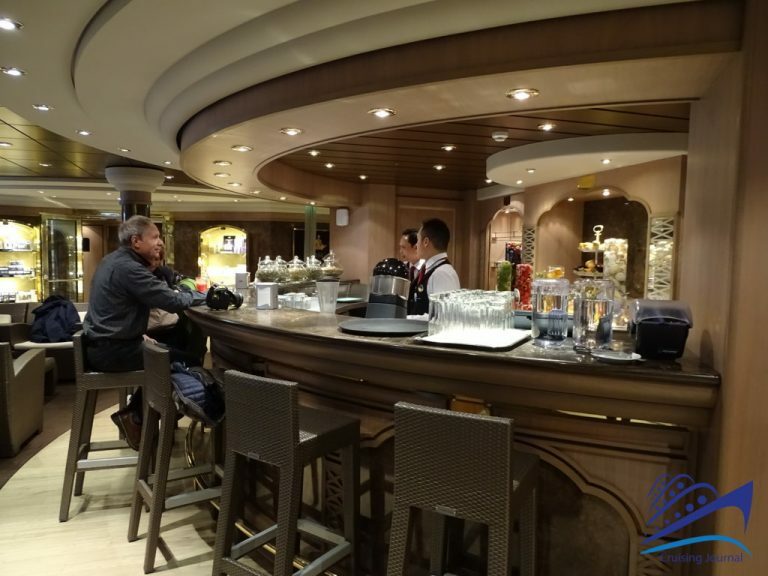 From here, on the far stern, you enter the Amethyst Lounge, the ideal place for after-dinner entertainment, with live music and other genres of entertainment. 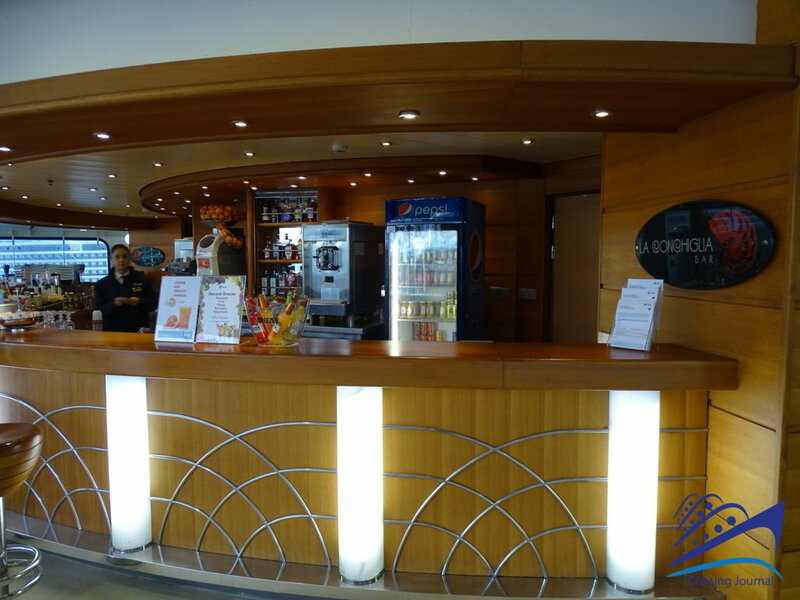 Served by its own bar, it is very spacious and also offers a quiet place during the day for lovers of reading and silence. 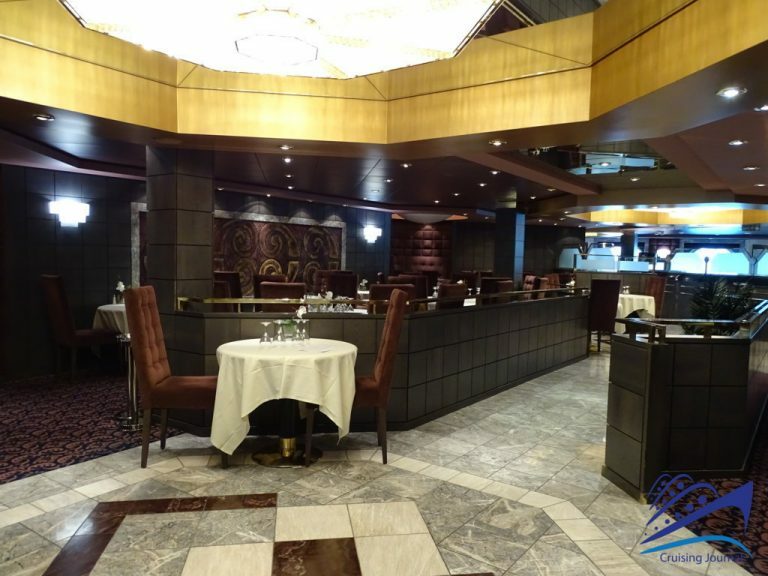 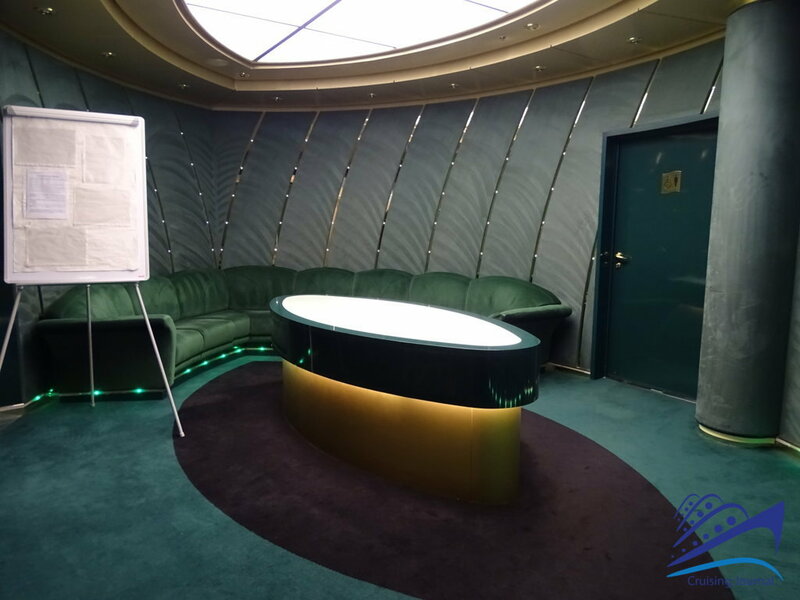 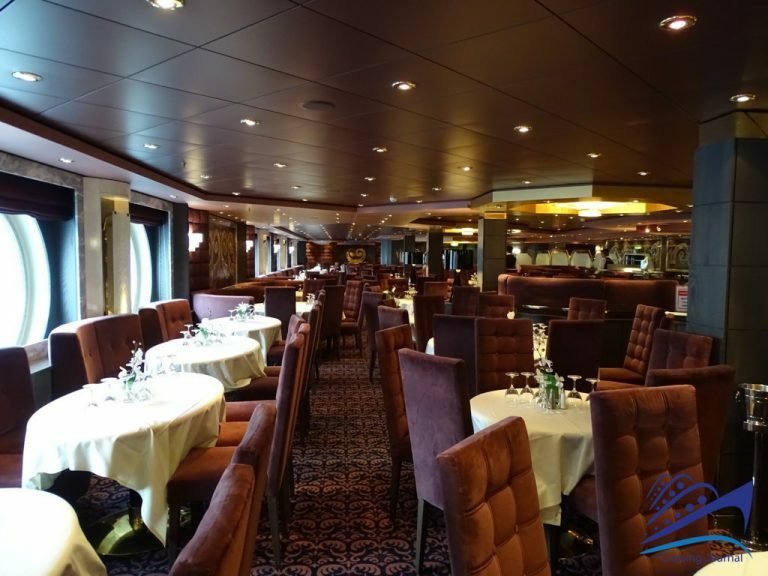 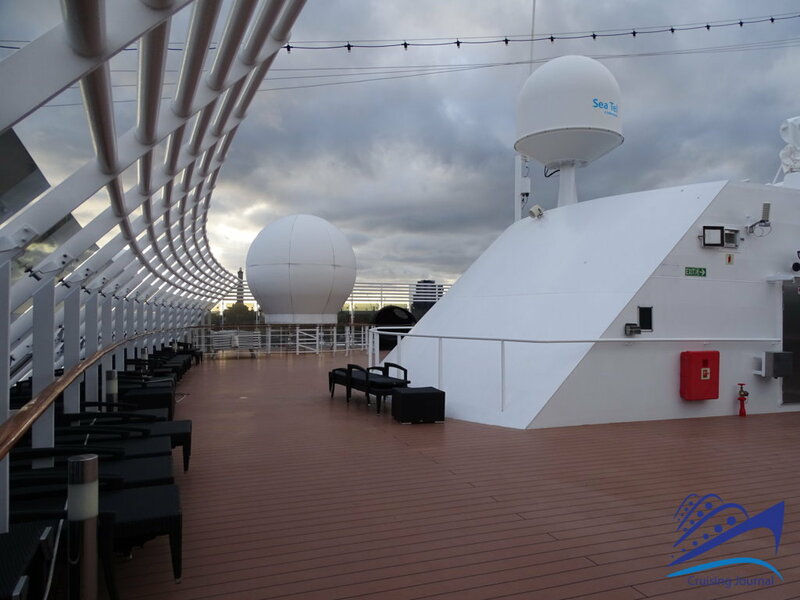 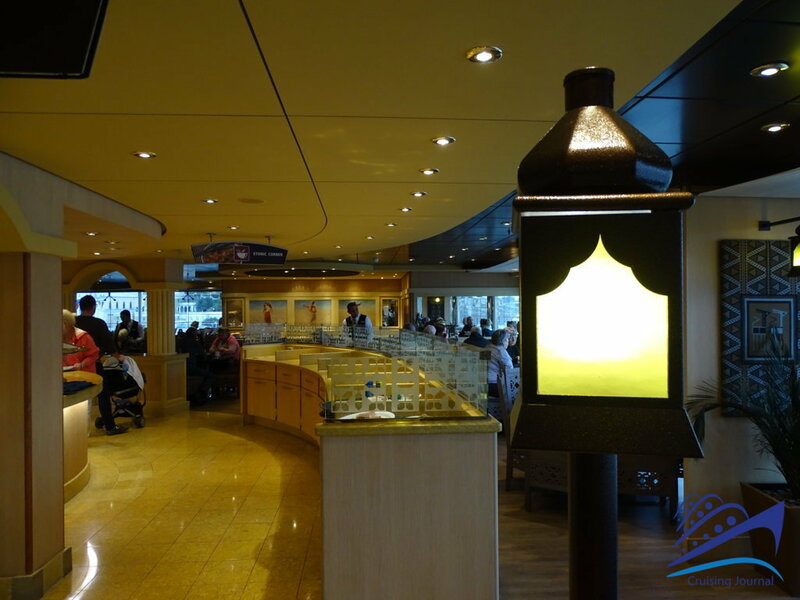 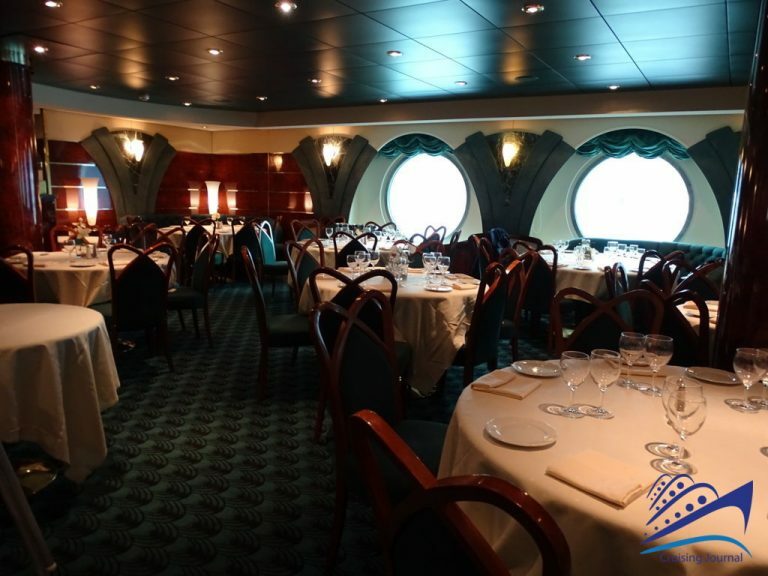 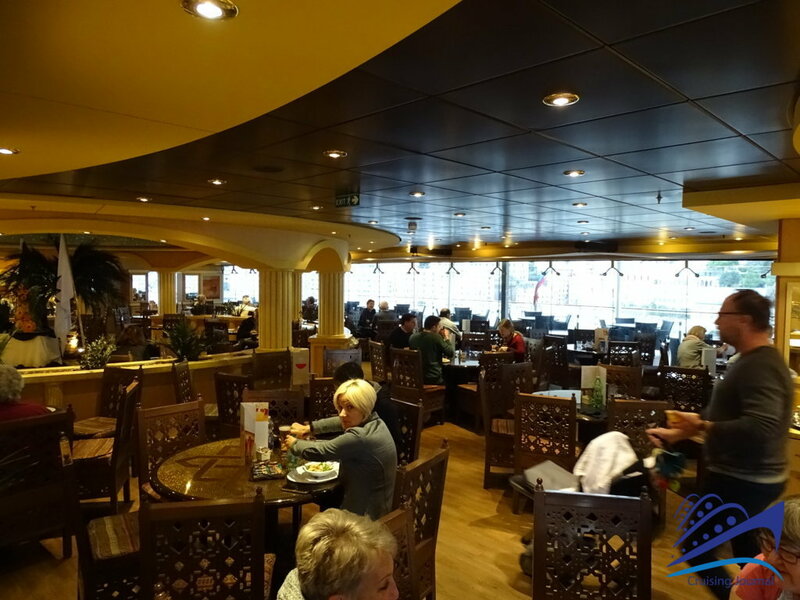 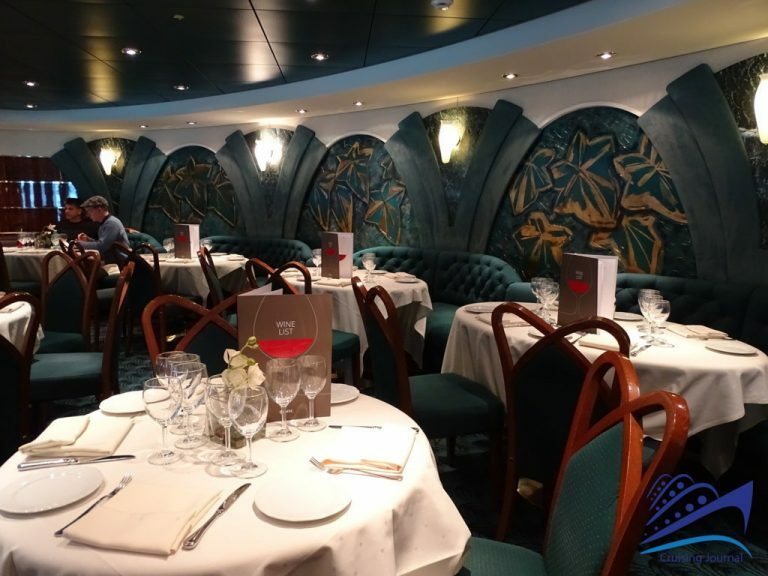 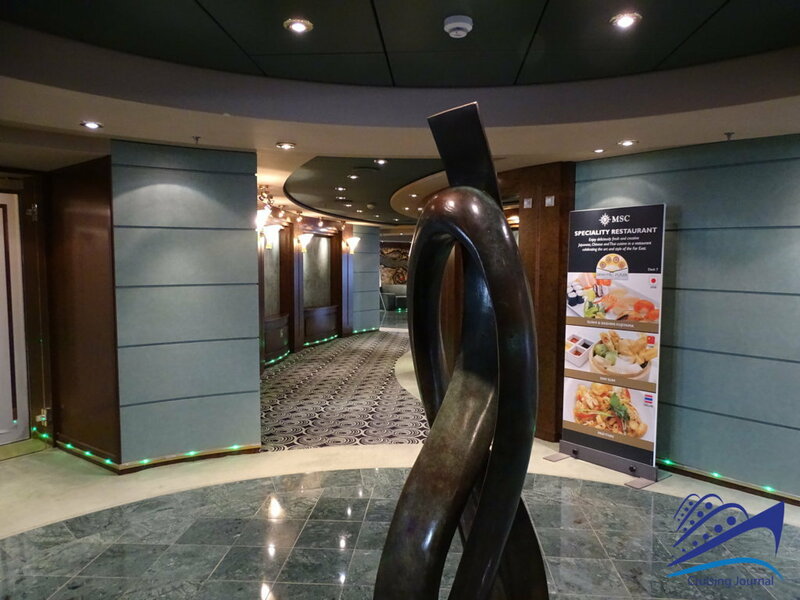 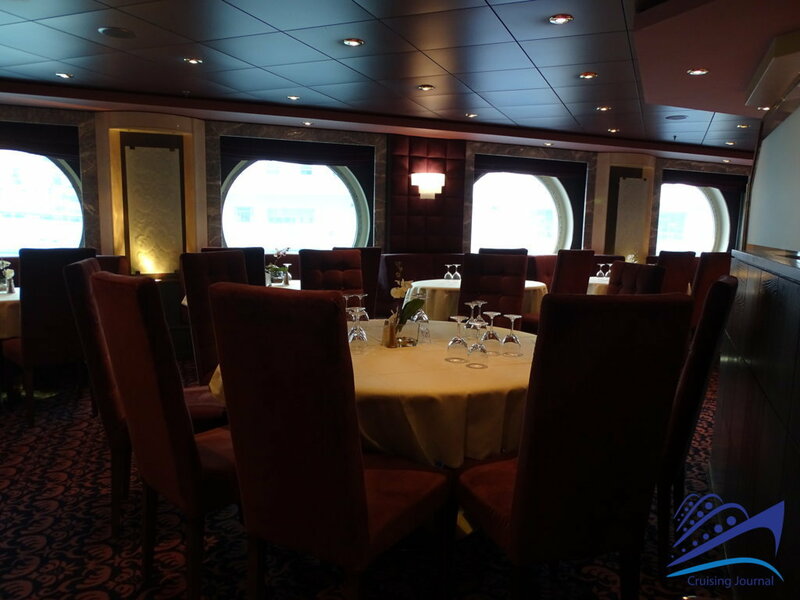 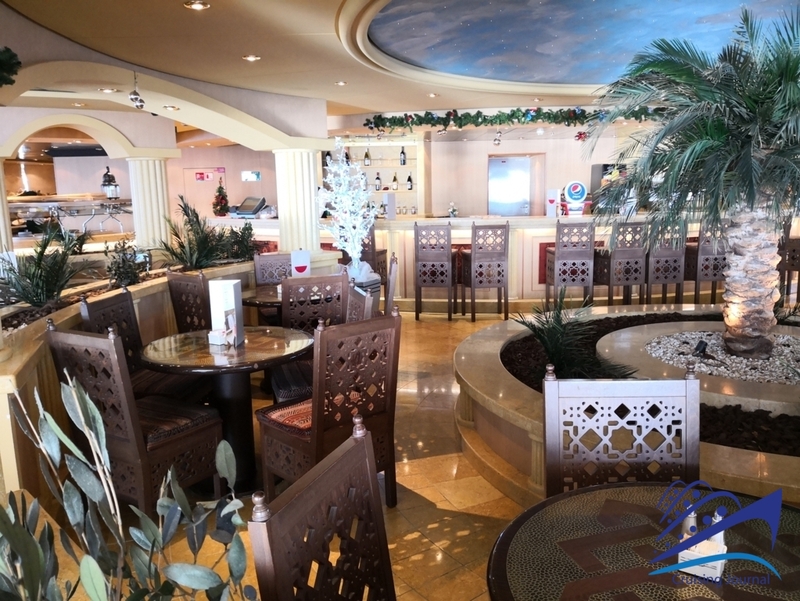 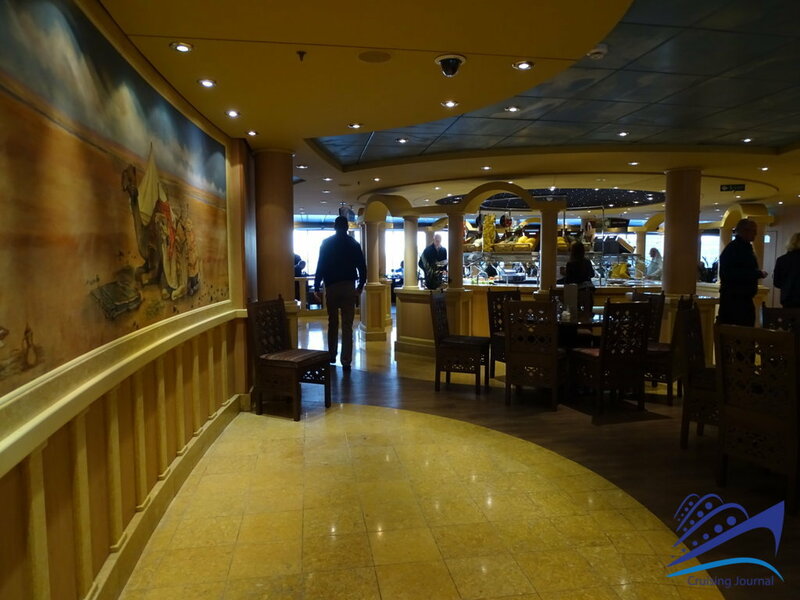 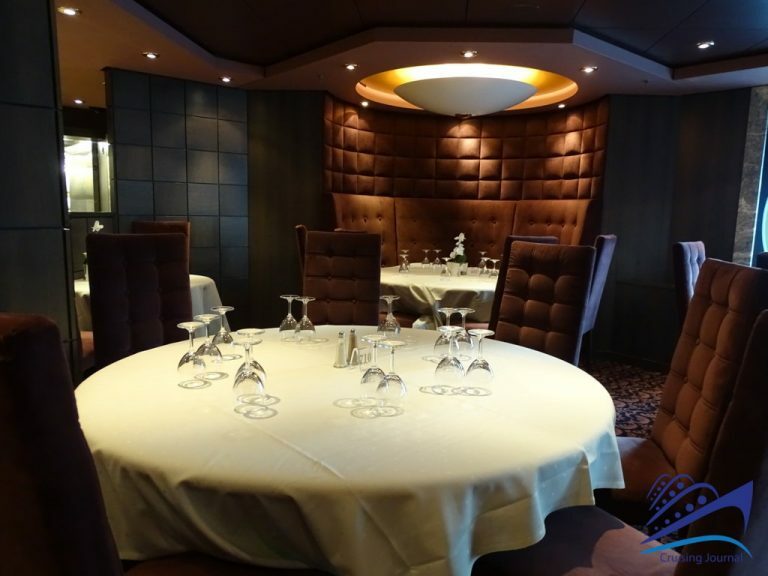 The on-board catering is divided into two main restaurants, the buffet restaurant on the Lido deck, and the already mentioned Oriental Plaza. 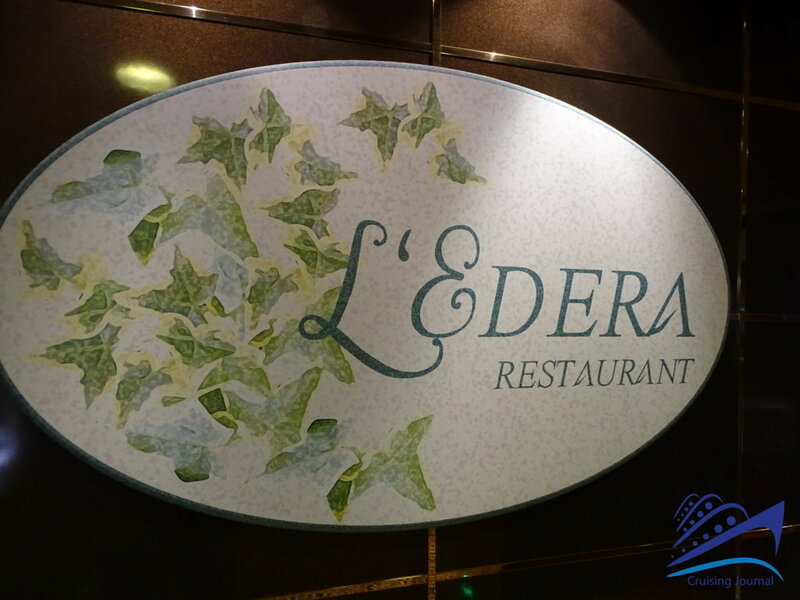 L’Edera and I Quattro Venti, the main restaurants, are located on decks 5 and 6. 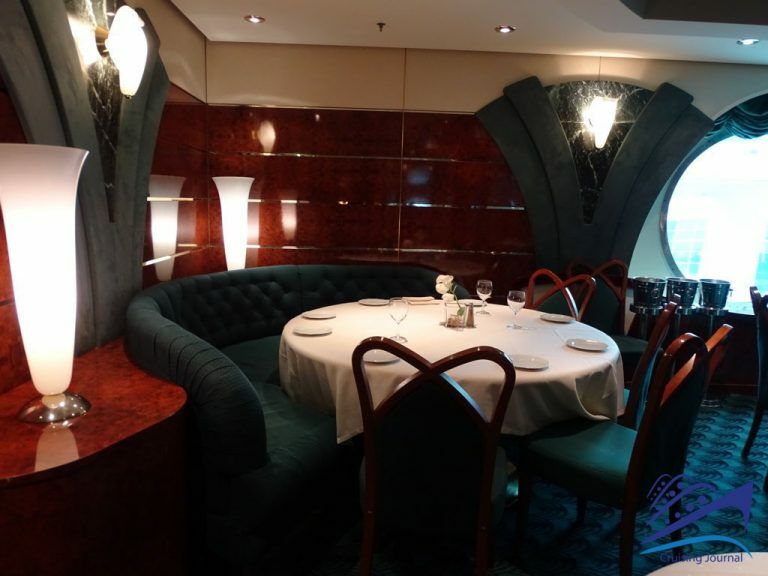 Both are similarly furnished and elegant, with high velvet chairs and large portholes overlooking the sea. 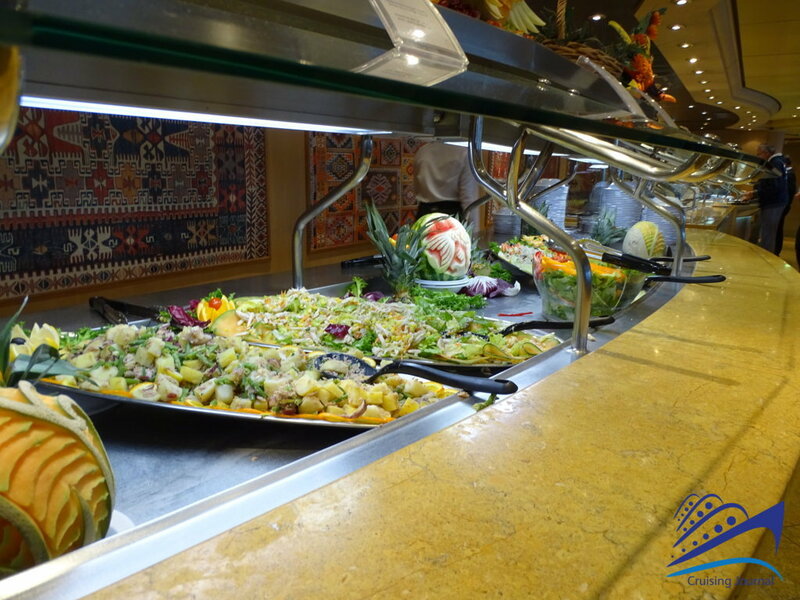 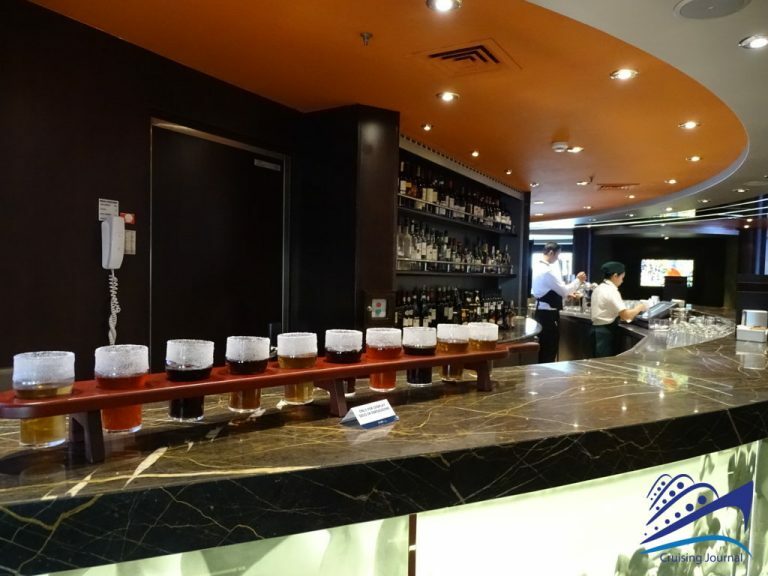 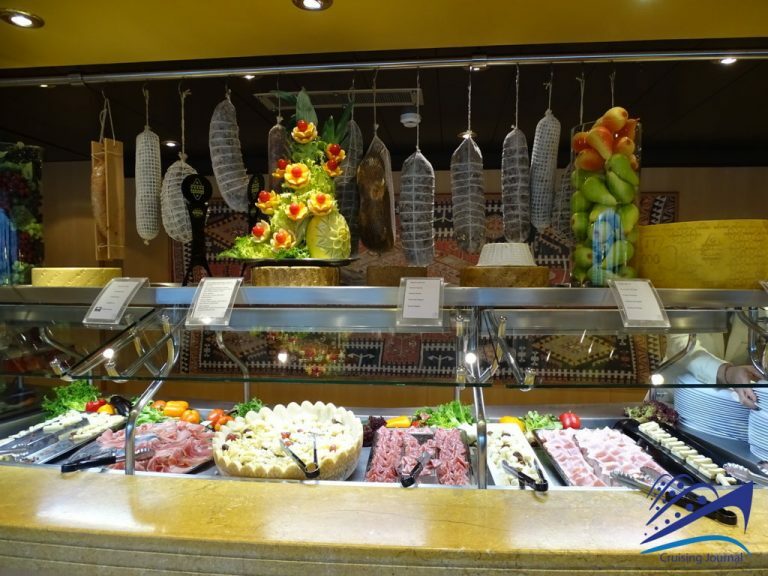 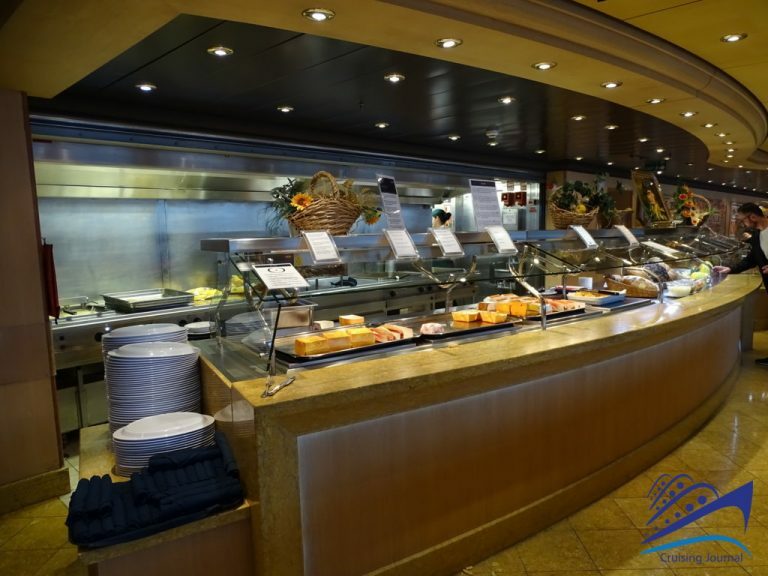 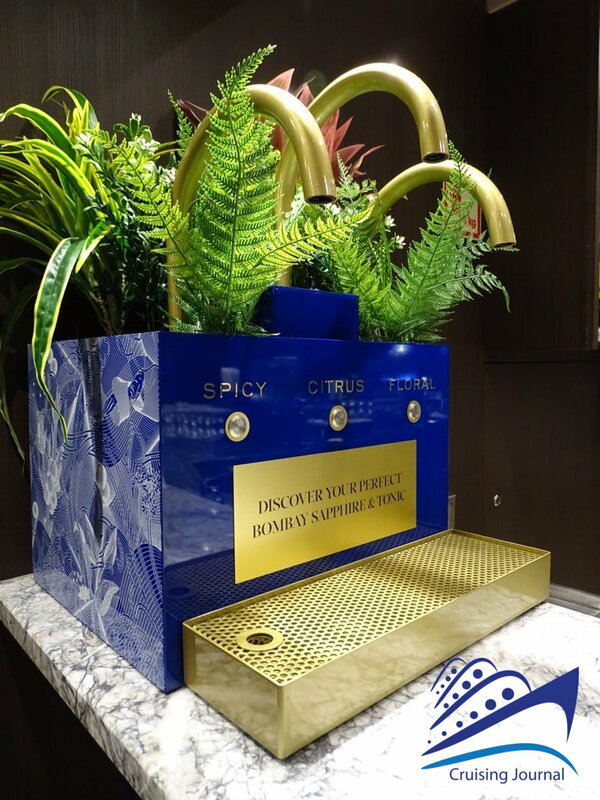 The Sahara Buffet is characterized by multiple stations for each type of specialty. The decorations are reminiscent of the desert and camels and on the whole it is lively, bright and well distributed. 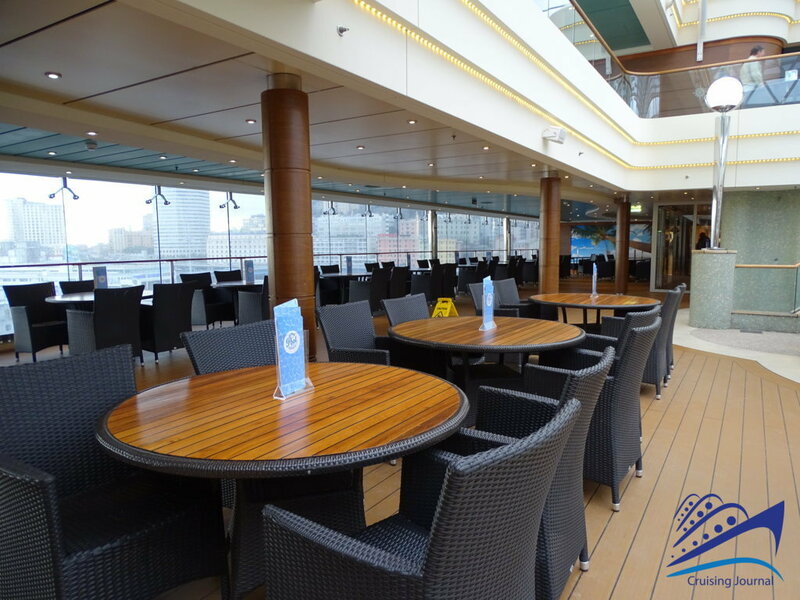 And also has a small outdoor terrace. 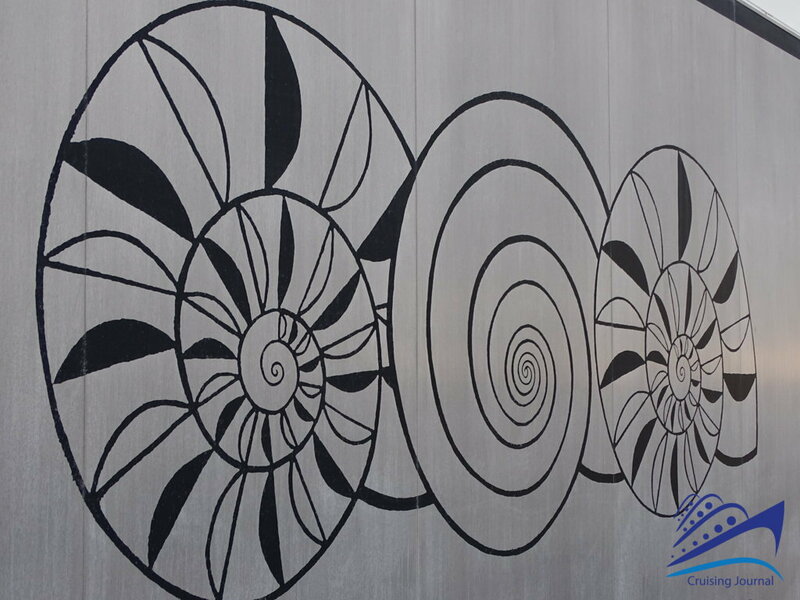 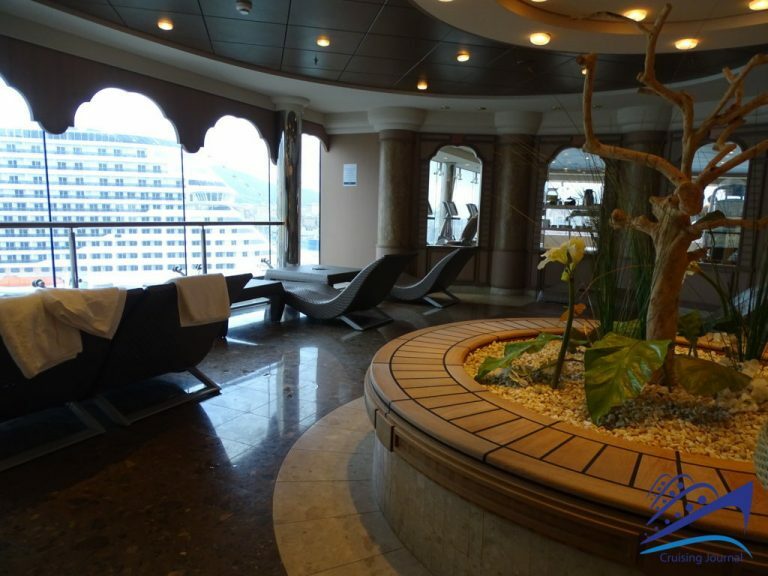 The Msc Aurea Spa offers a large number of treatments and beautiful areas for training, massage and relaxation. 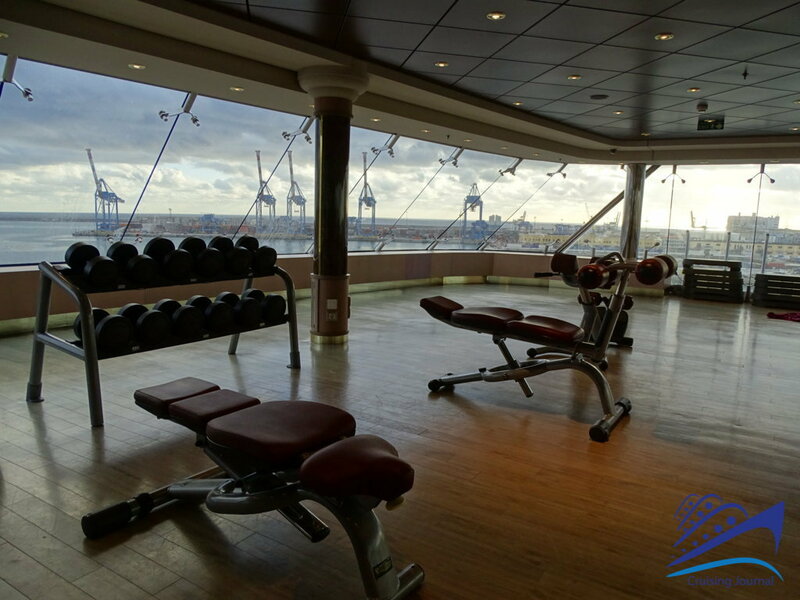 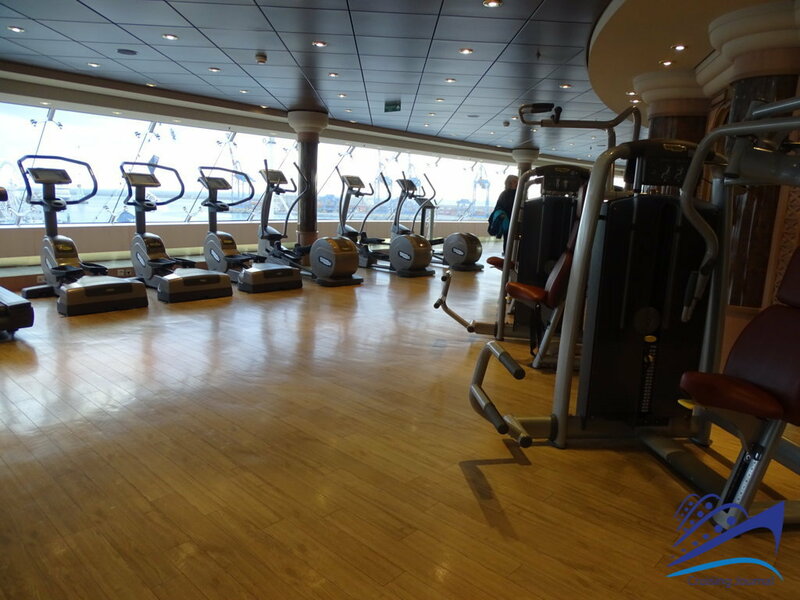 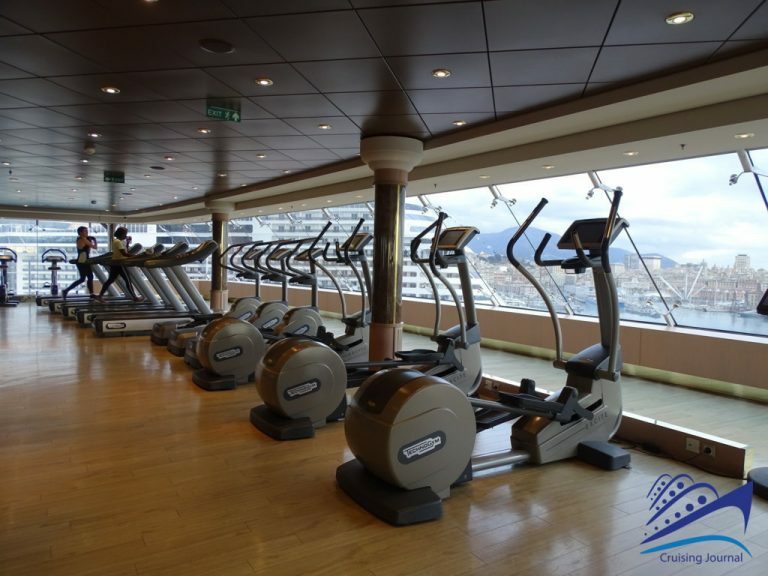 The gym overlooks the bow with a beautiful view of the sea. 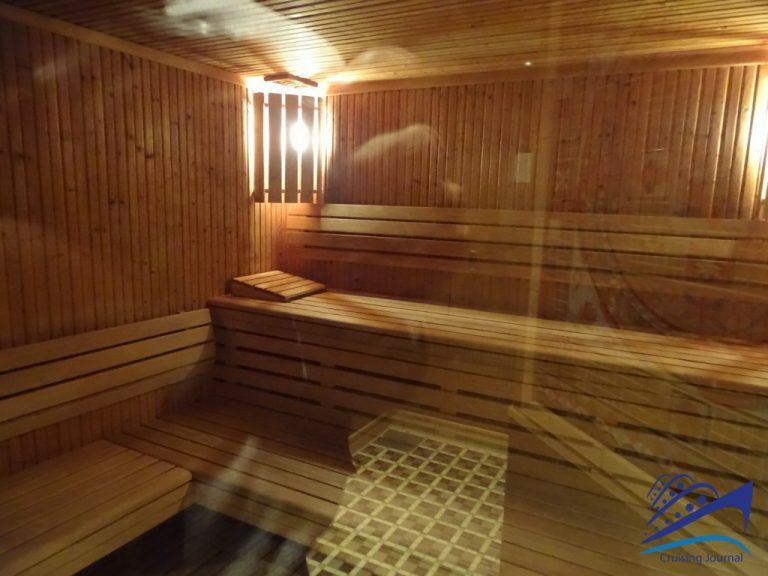 Two types of sauna are combined with a Turkish bath and an area with two large Jacuzzis, also with sea views. 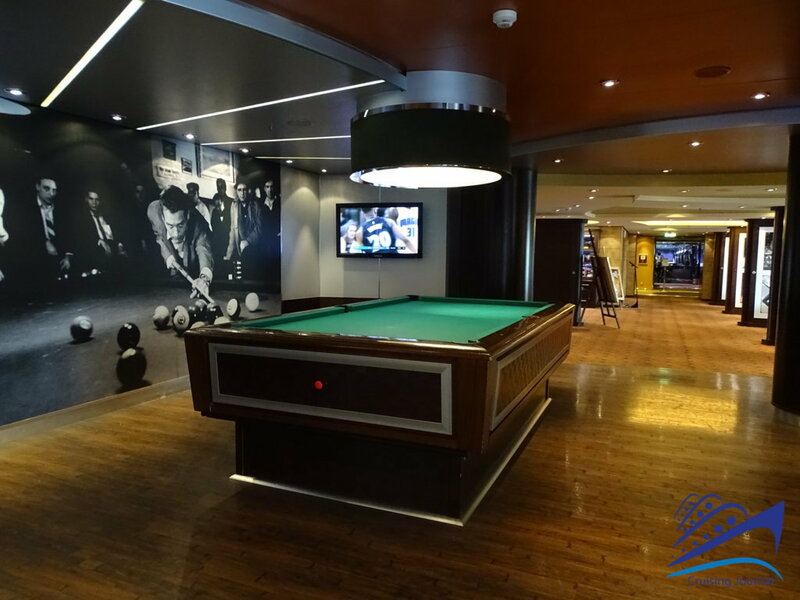 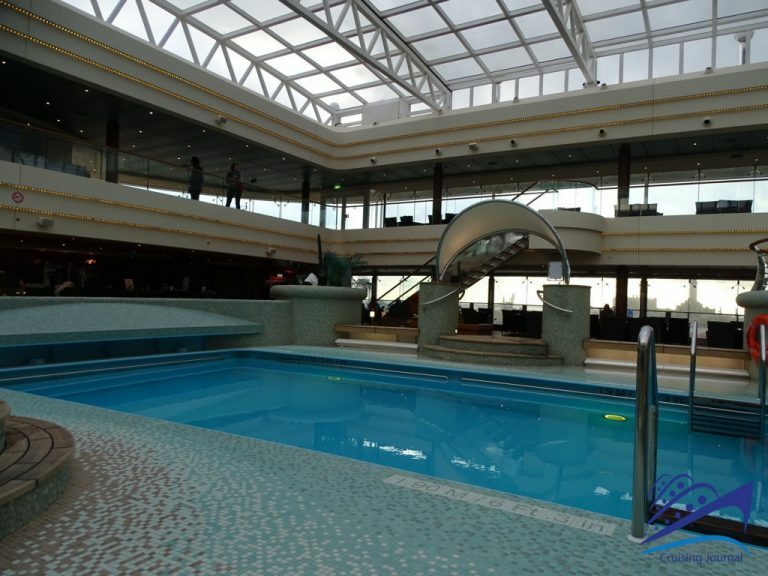 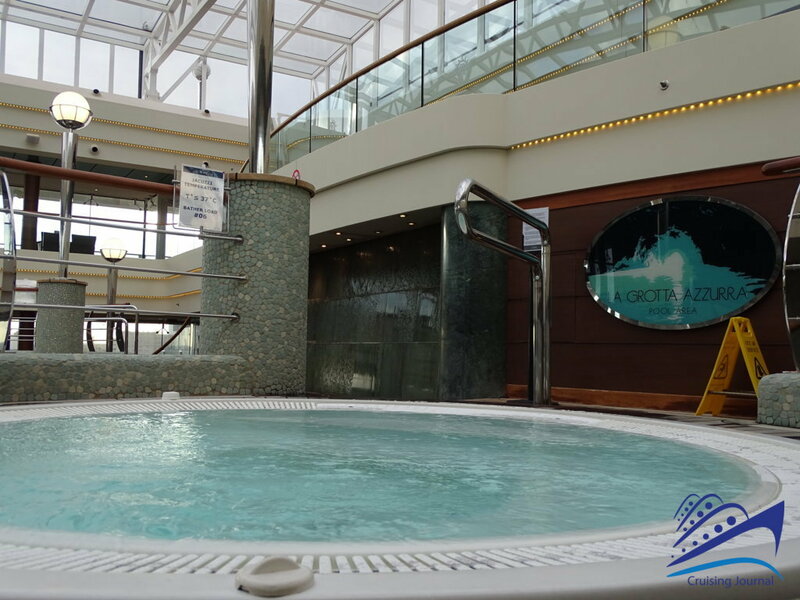 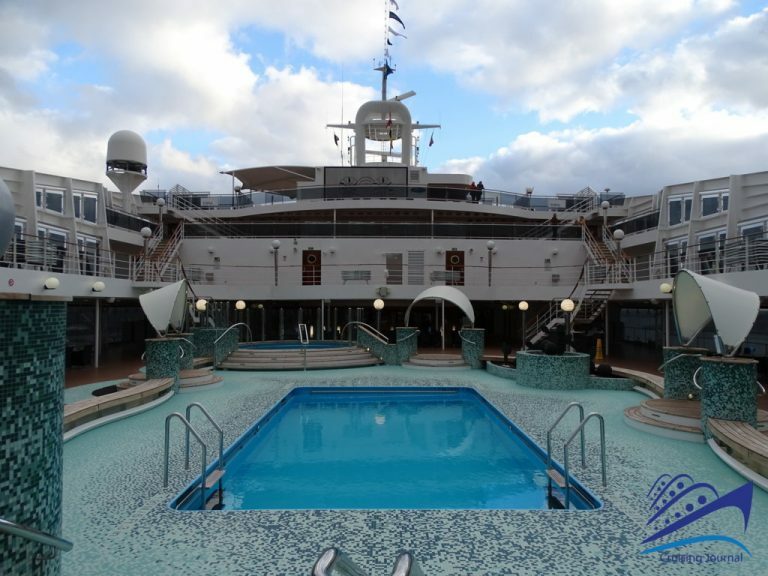 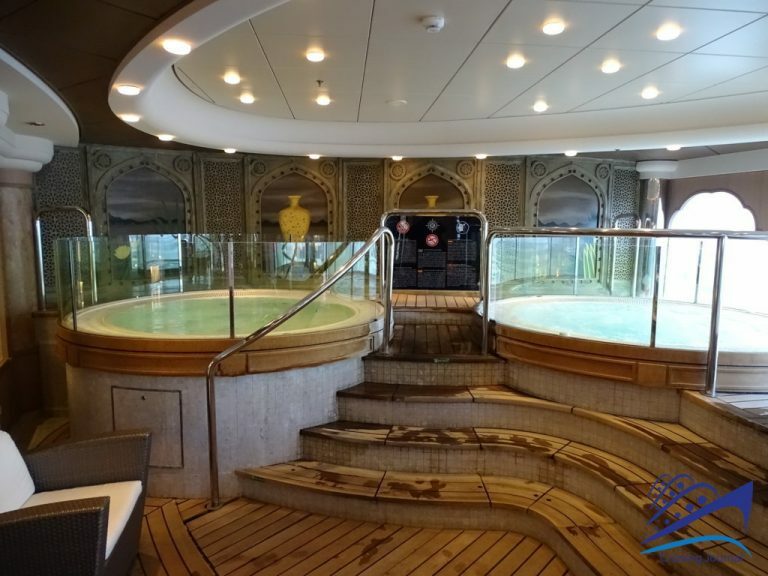 Characteristic of Msc Magnifica and much appreciated peculiarity on board is the indoor pool La Grotta Azzurra, located in the middle of the ship on deck 13 Porto Cervo. Next to two Jacuzzis, you can enjoy the pool in every season, sheltered by the glass roof. 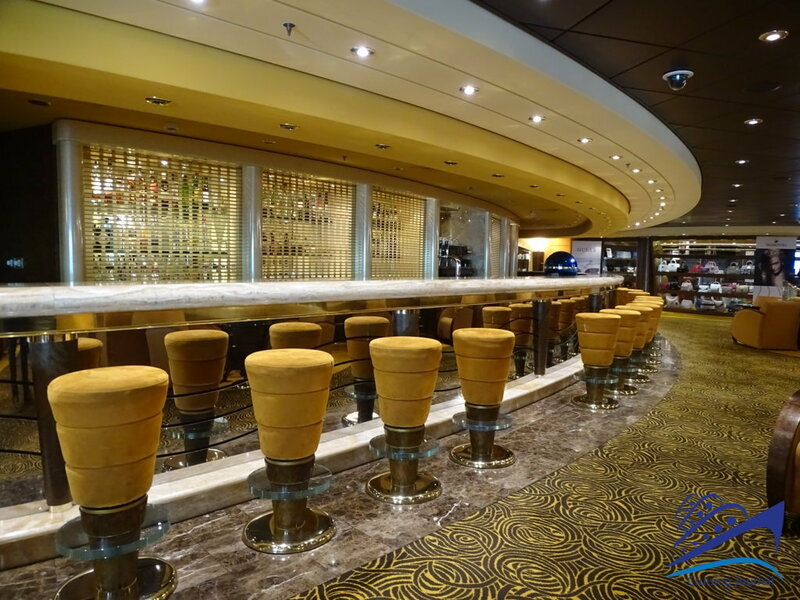 The area is served by La Barchetta Bar. 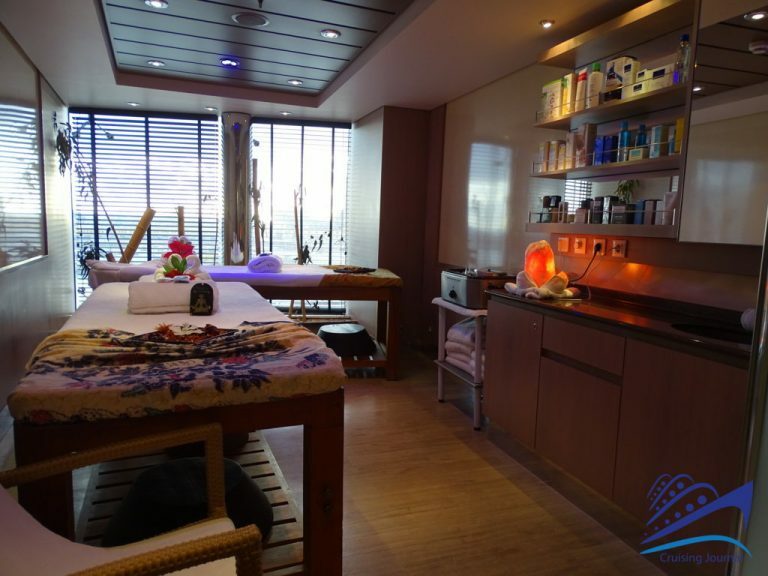 Deck 14 Positano, which has Aurea cabins in the bow, offers other rooms for passengers. 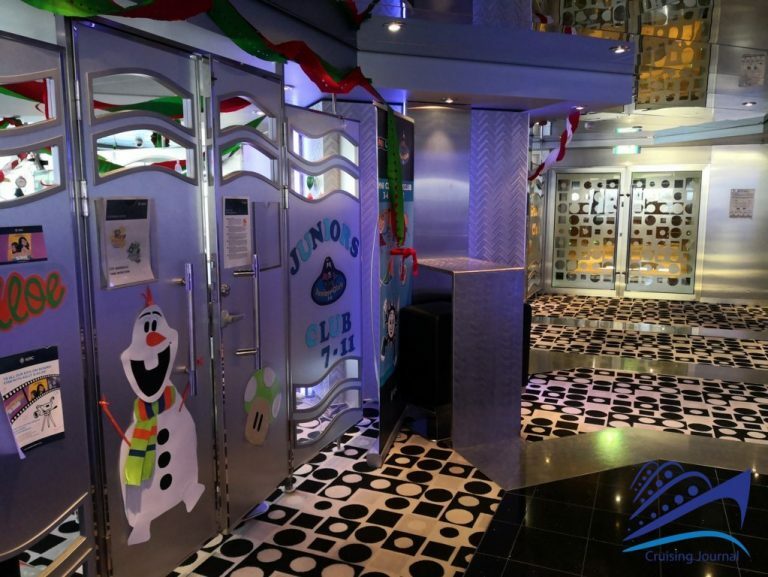 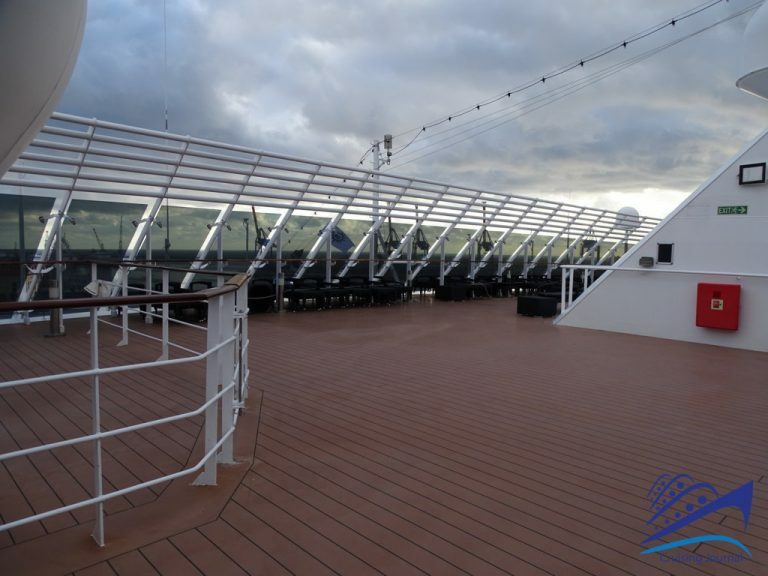 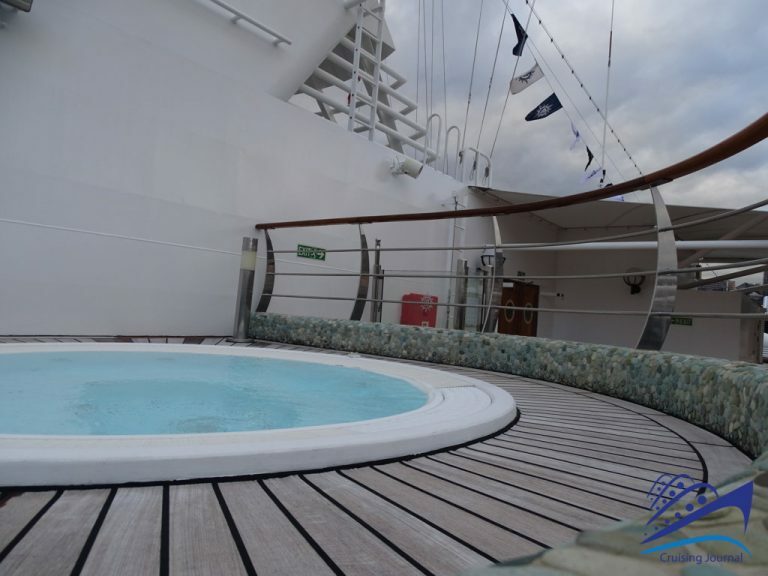 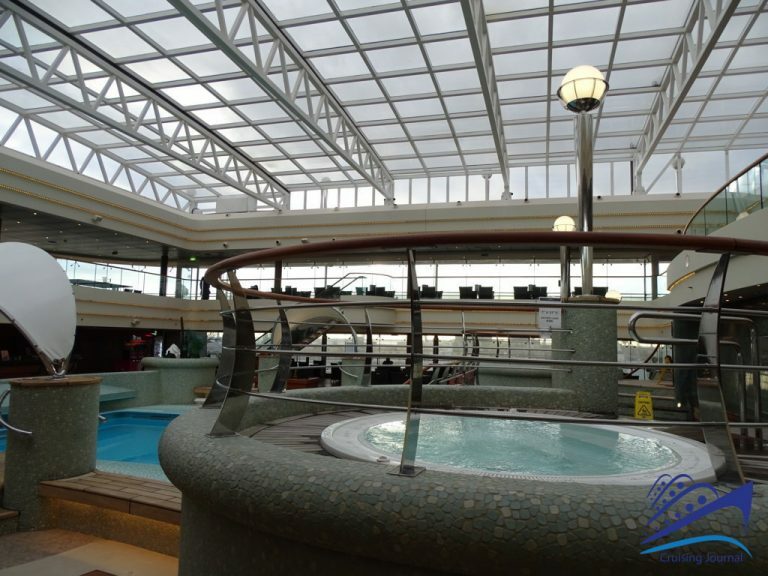 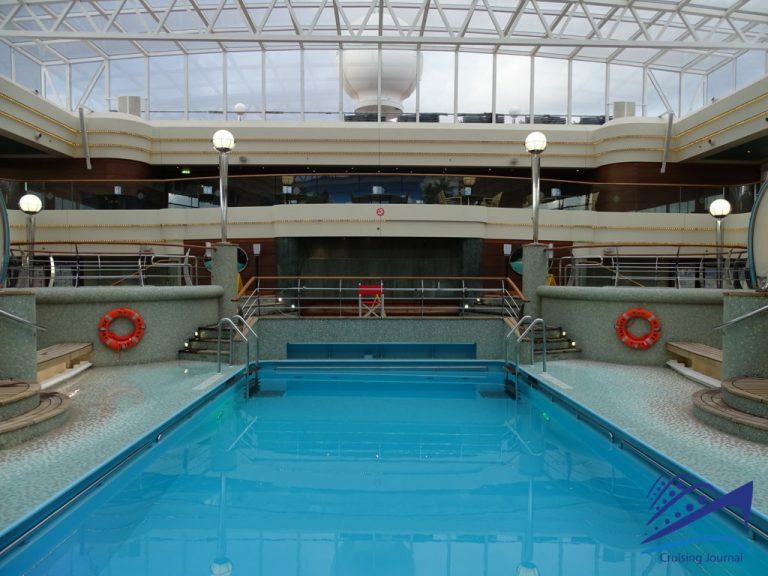 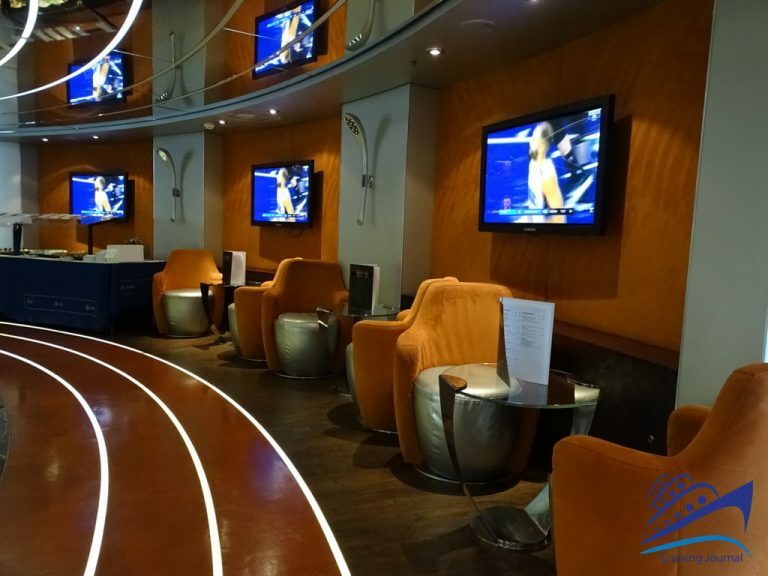 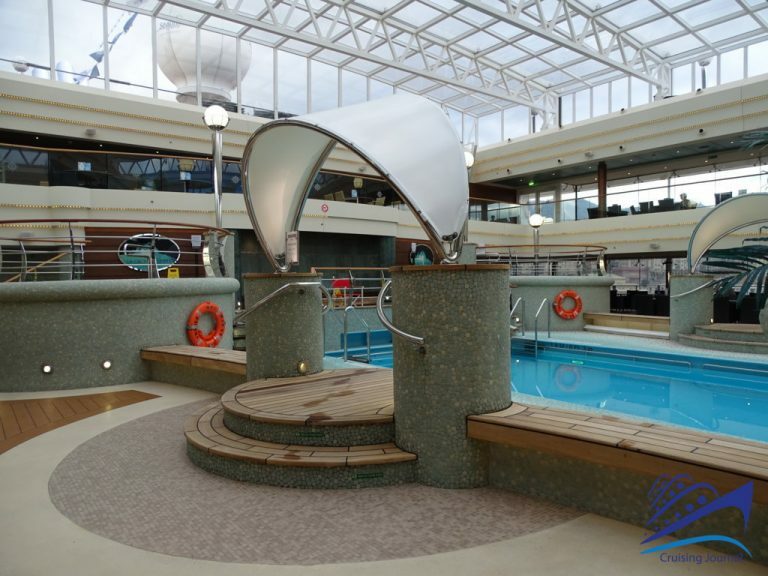 An external Jogging Track at the front of the ship and spaces reserved for children in the middle of the ship (Children’s Outdoor and Indoor Playrooms) with their own small swimming pool. 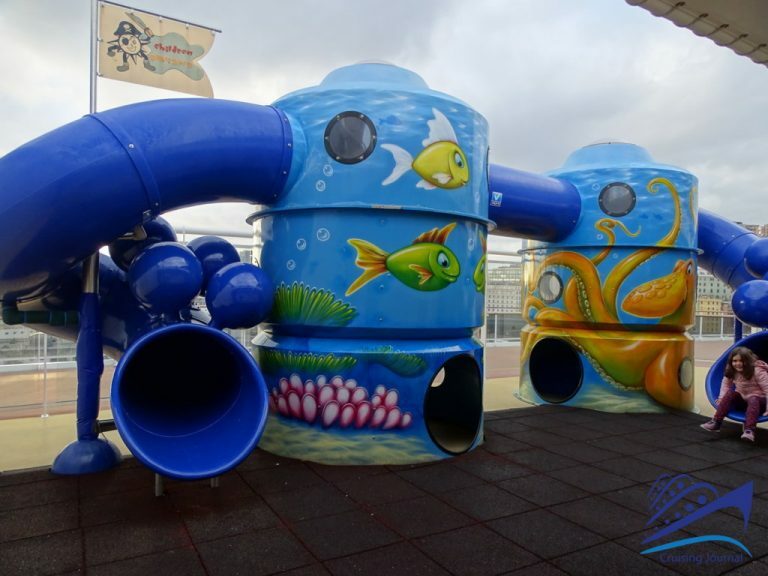 Collaborations with well-known brands such as Chicco and Lego guarantee the full satisfaction of the smallest guests! 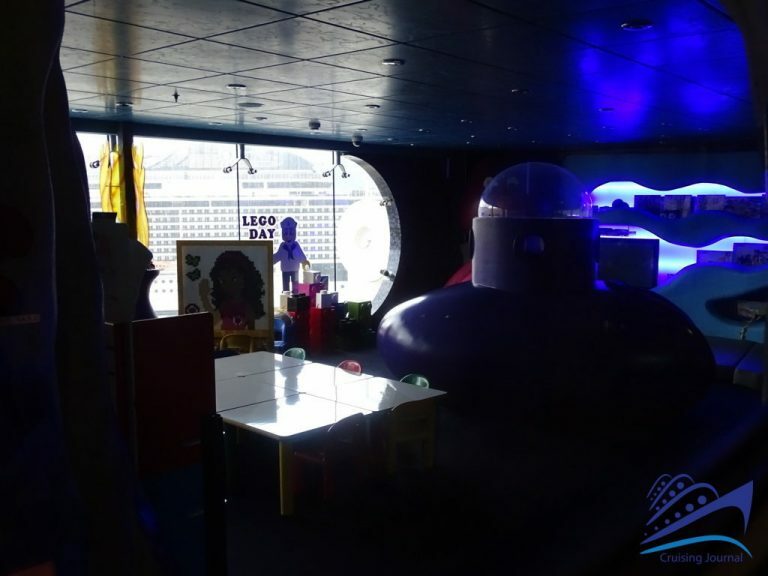 Also, there are other places dedicated to teenagers, with a game room and a small bowling alley and the T23 Disco, a place to pull late in the evening. 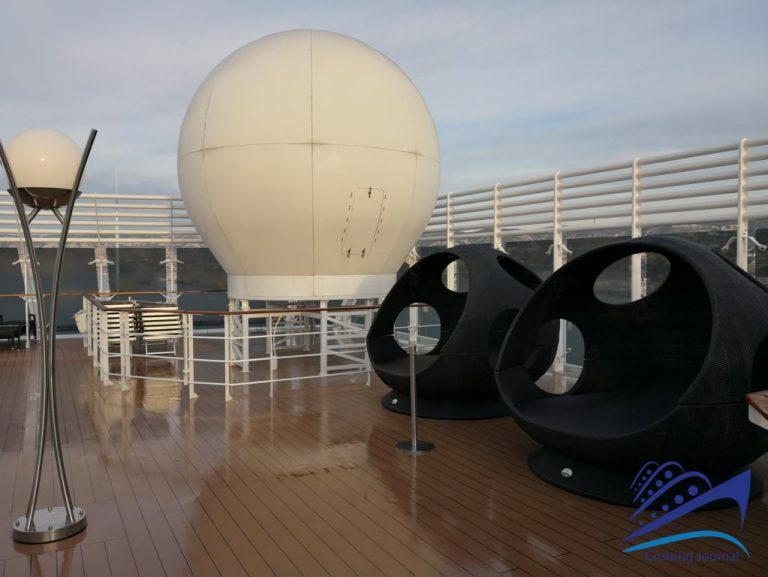 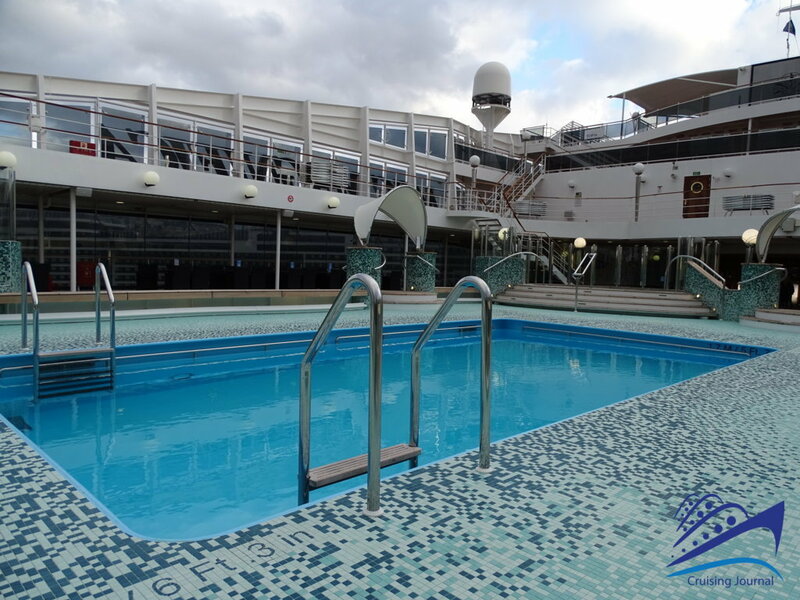 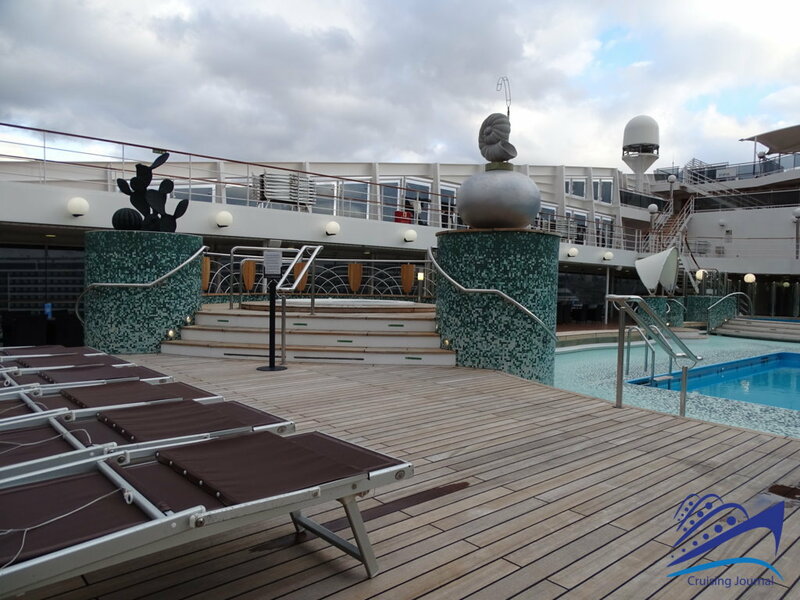 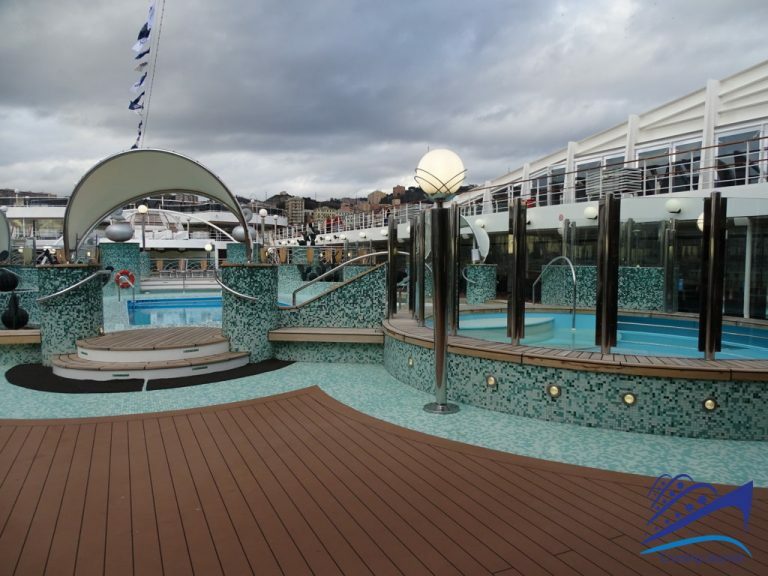 The outdoor areas of Msc Magnifica are also very spacious and loveable, starting with the outdoor Lido Le Grand Bleu, located on deck 13 beyond the indoor pool. 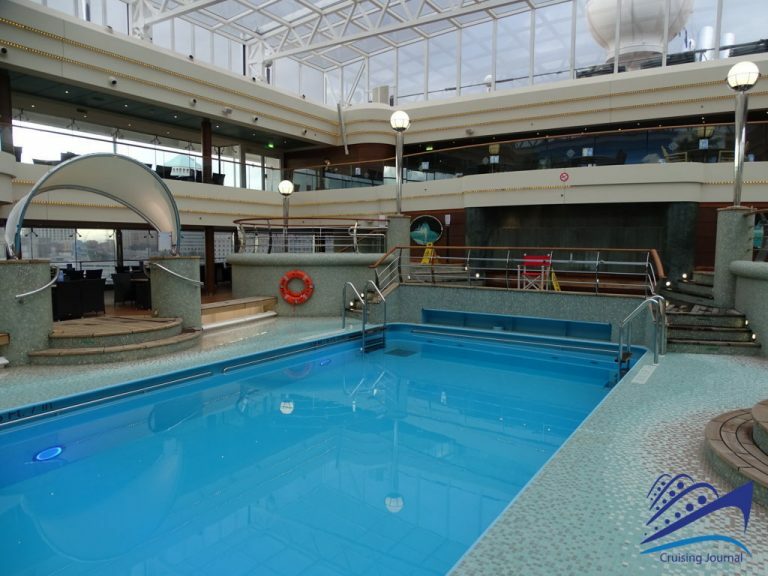 Large central pool with two Jacuzzis, solarium and entertainment area with teak floor. 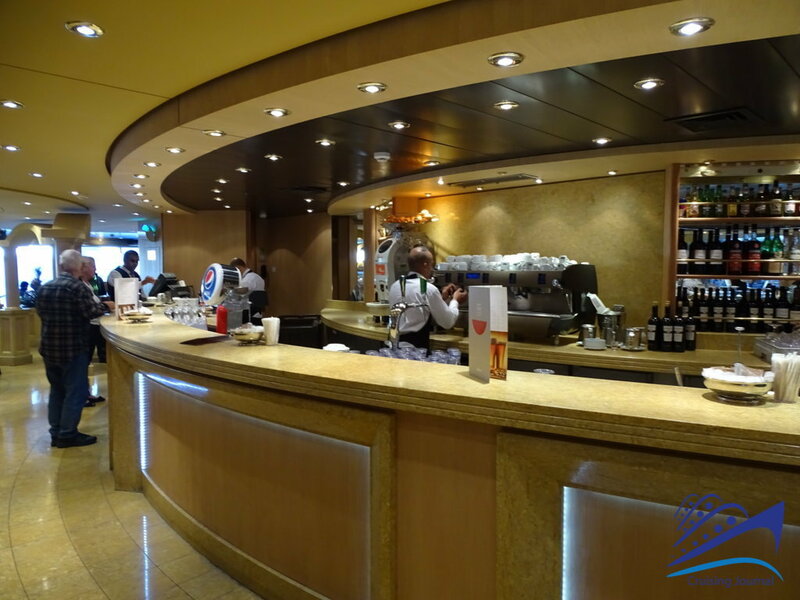 The Lido area is served by the Bar La Conchiglia. 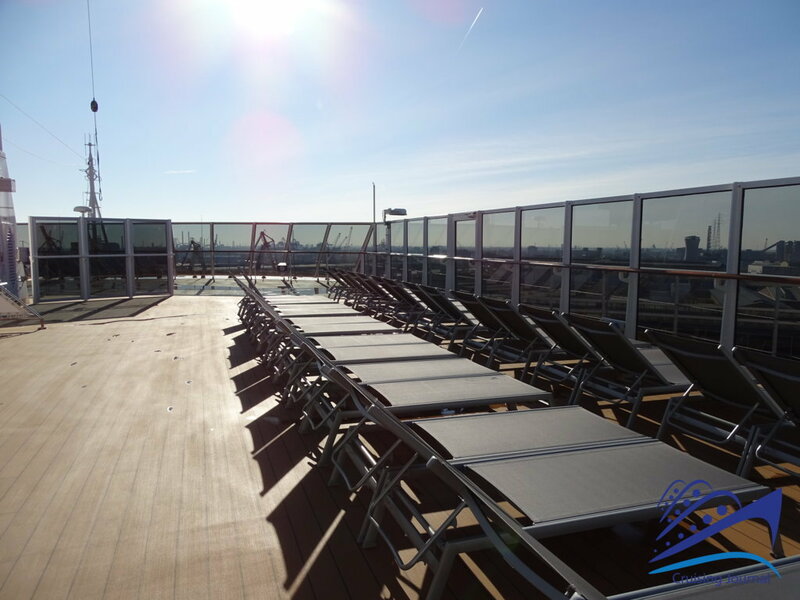 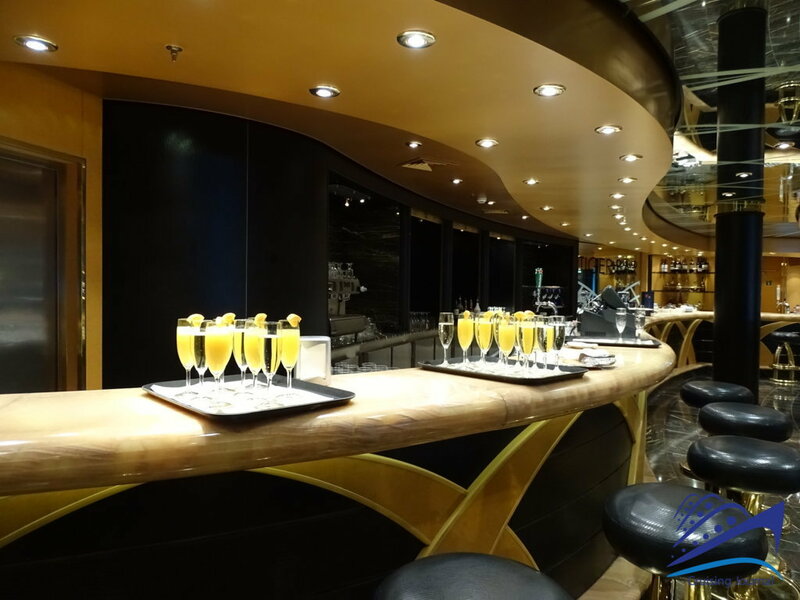 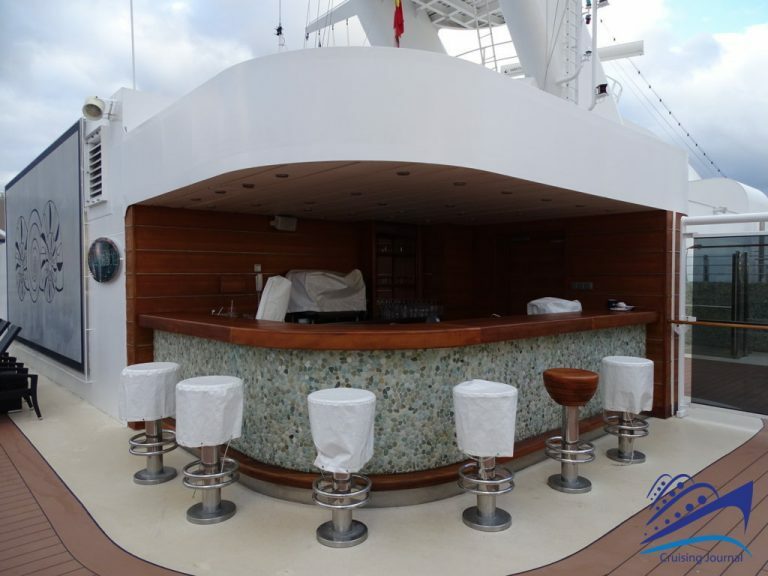 On deck 16 Sport, in the bow area, there is the Top 16 Exclusive Solarium, served by Il Bar del Sole, reserved for guests of the Aurea cabins or accessible for a fee. It is one of the most relaxing and peaceful areas where you can enjoy the navigation and the sun. 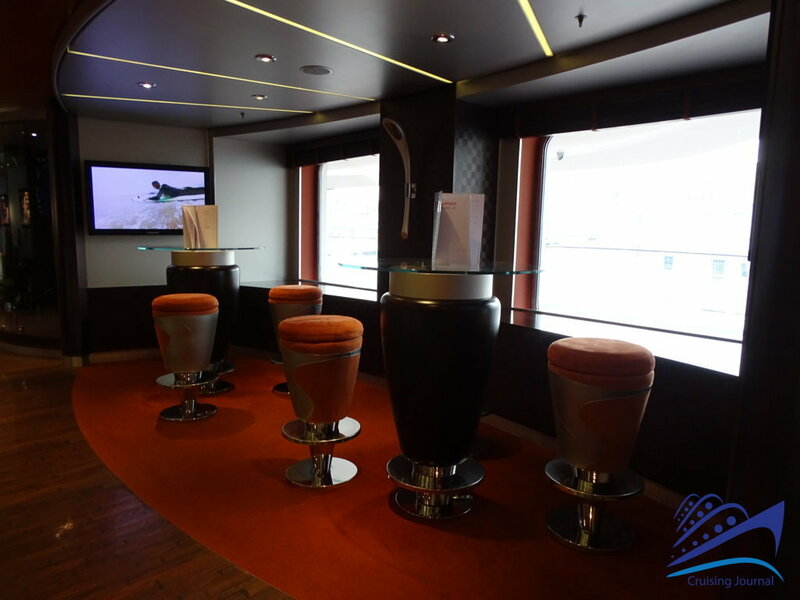 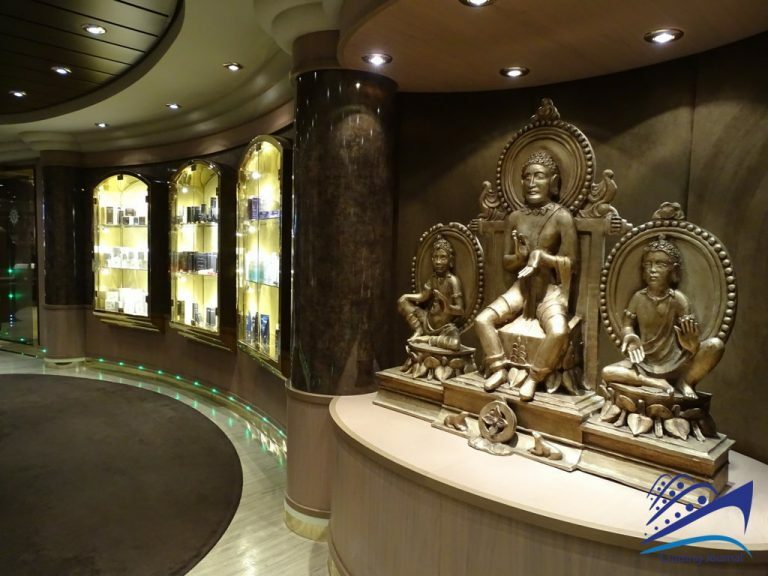 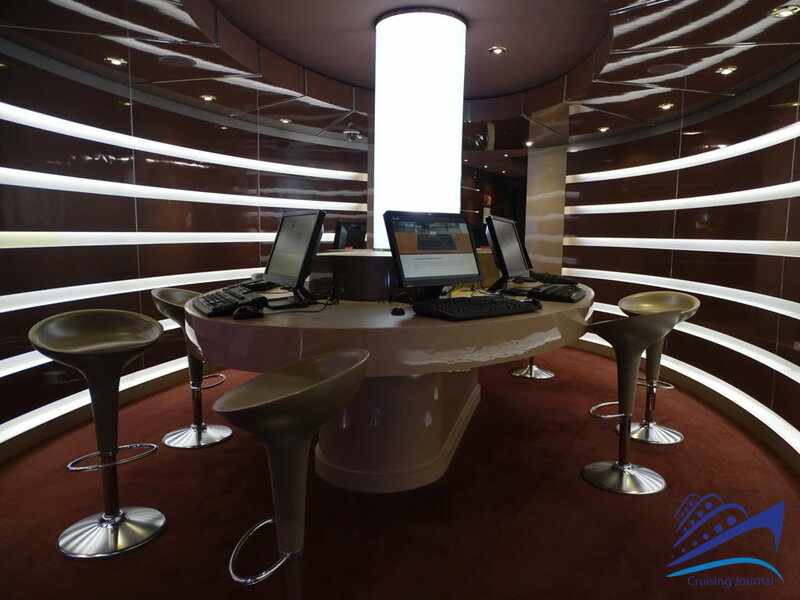 The types of cabins and on board of Msc Magnifica are naturally many and well diversified. 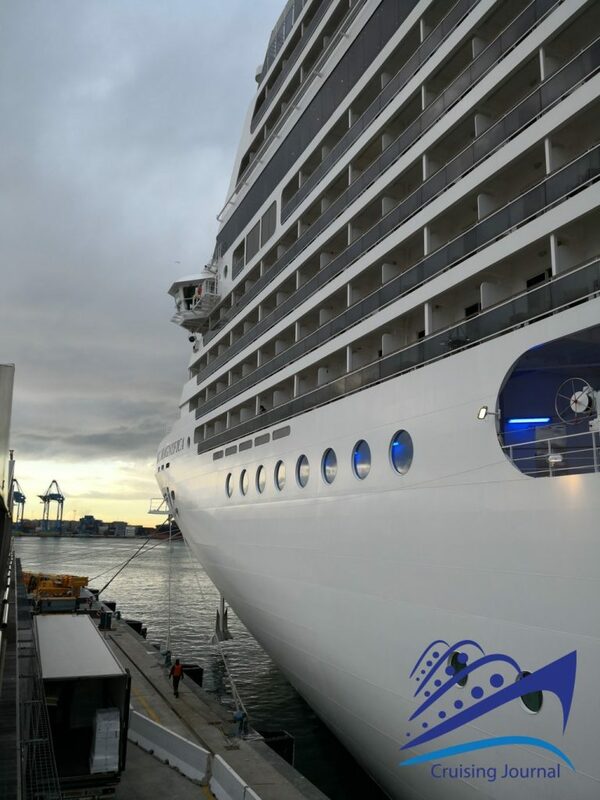 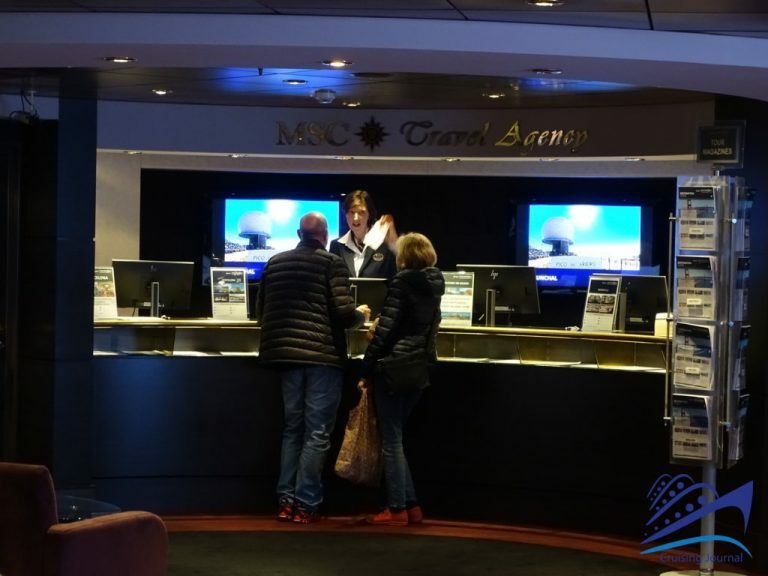 In addition to the subdivision of MSC Cruises into three different “experiences” (Bella, Fantastica, Aurea), there are mainly categories of external, partial sea view, sea view, balcony, super family (up to 5 beds) and suites. Msc Magnifica is a very appreciable cruiseship, equipped with every comfort and advanced services, able to offer a size still on a human scale, albeit in its considerable size. 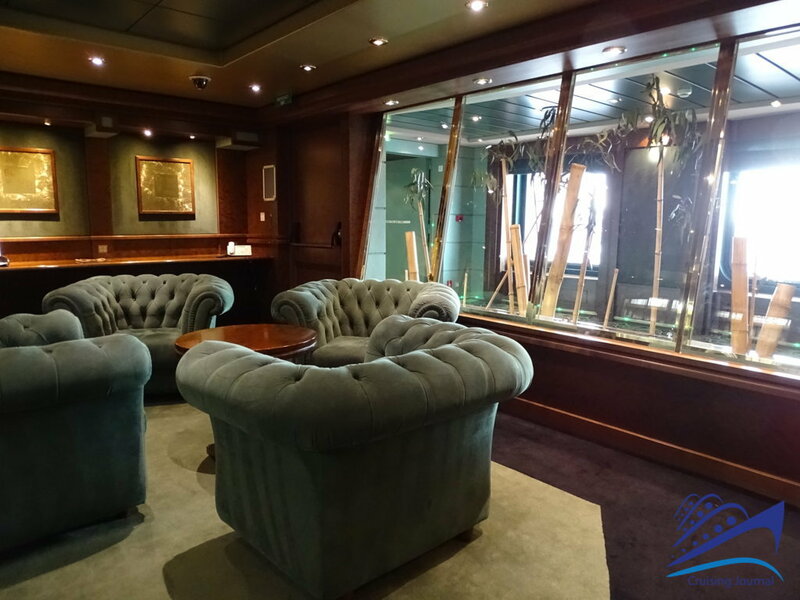 The optimal distribution of indoor and outdoor spaces allows you to settle quickly and enjoy what this successful class of ships offers.